The ATG holiday finished after breakfast on Saturday morning. 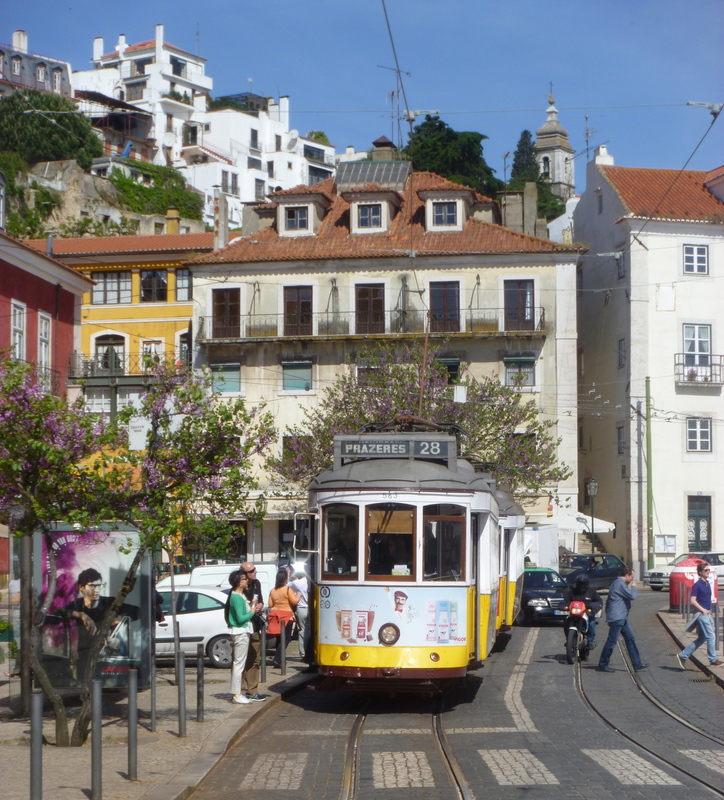 We’d eaten early and walked down to Sintra Station for the 40 minute train journey to Lisbon Rossio Station. We passed the National Palace on our way. It’s on my list for my next visit! 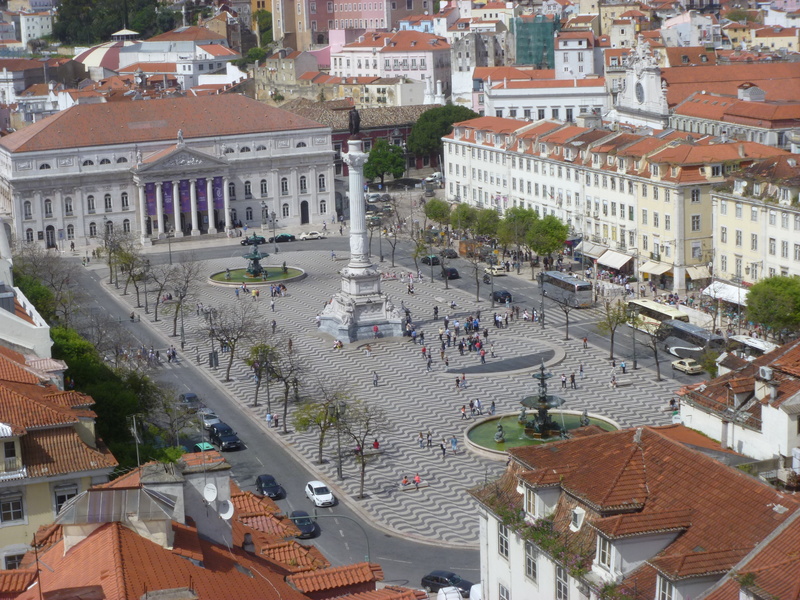 We’d added an extra night to the trip so that we might gain a flavour of Portugal’s capital city. 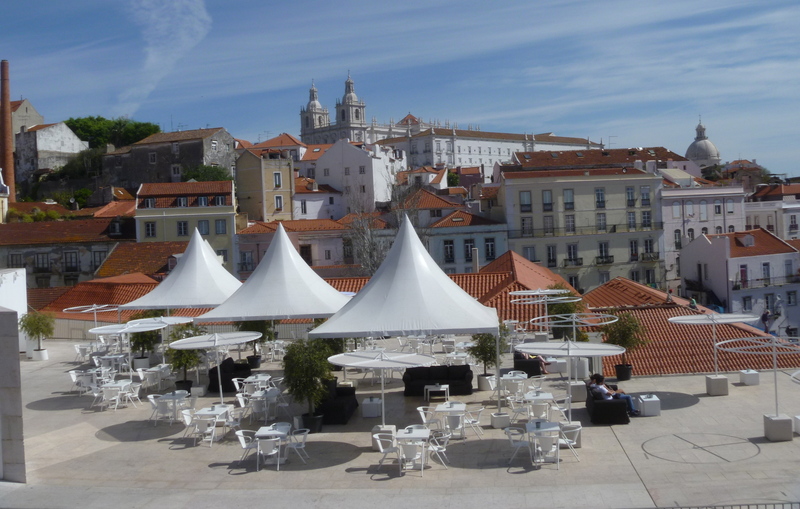 From Rossio Square it was a 20 minute walk to our B&B in the shadow of the Sé Cathedral in the medieval Alfama district. Our hostess Teresa met us and let us leave our bags giving us a local map and a few suggestions for a day’s walking in Lisbon. The hill and step climbing didn’t stop at the end of the walking holiday. 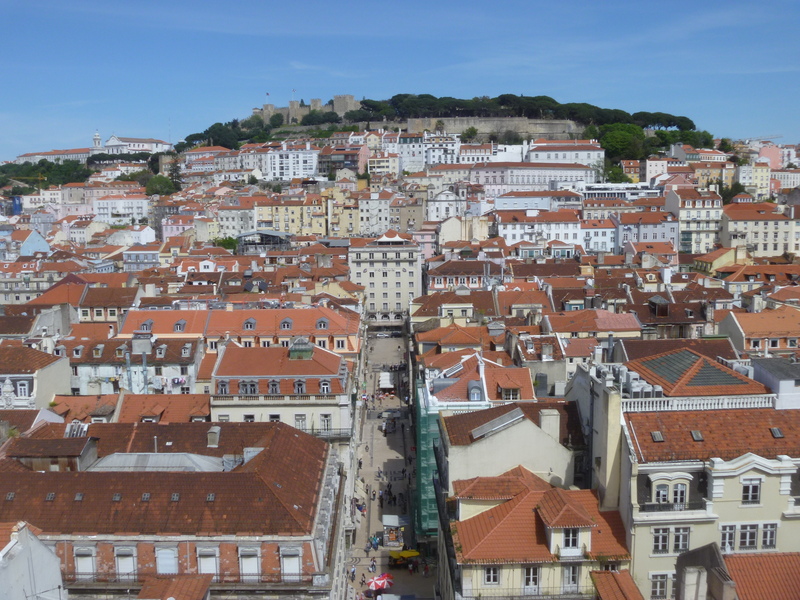 Lisbon is a hilly city. 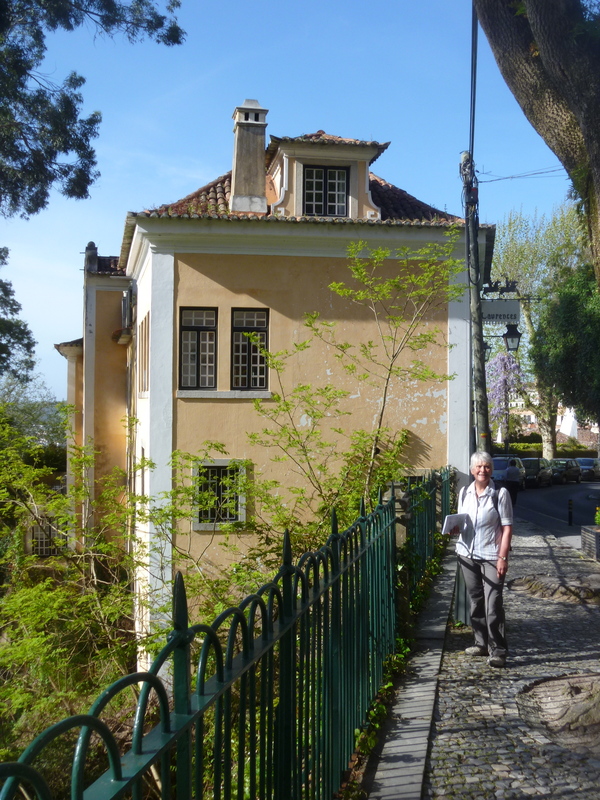 First off we walked along the route of the famous old 28 tram up to the viewpoints at Santa Luzia and Portas do Sol Squares. 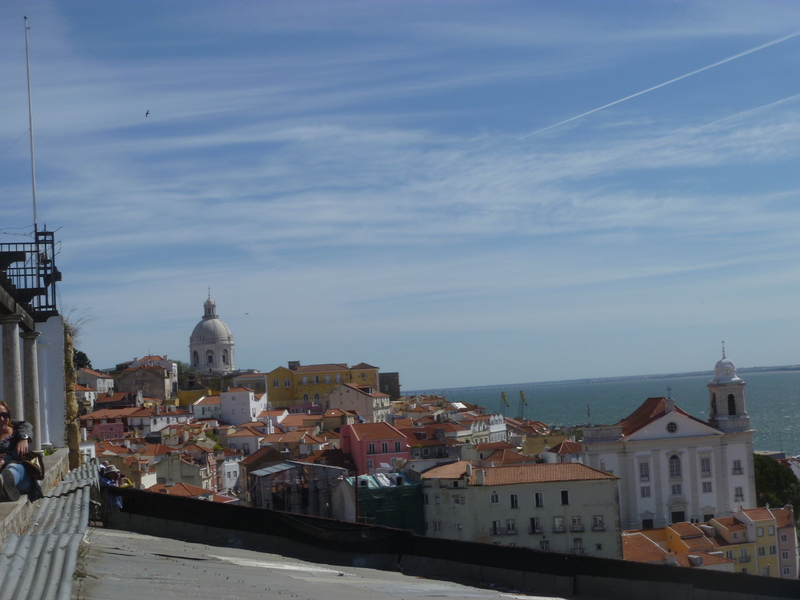 Fantastic views over Lisbon and its port, Alfama and the River Tagus. 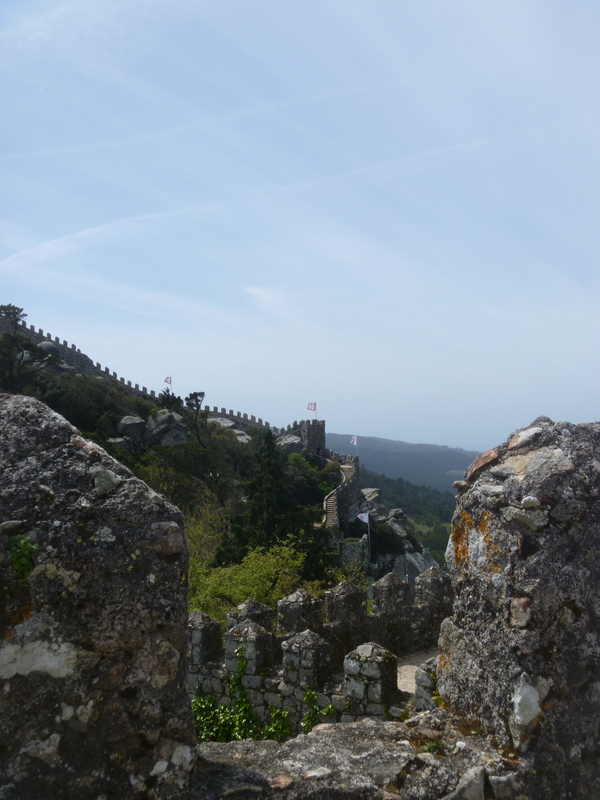 Further climbing brought us to the end of the queue for the ticket office for the Castelo Sao Jorge. 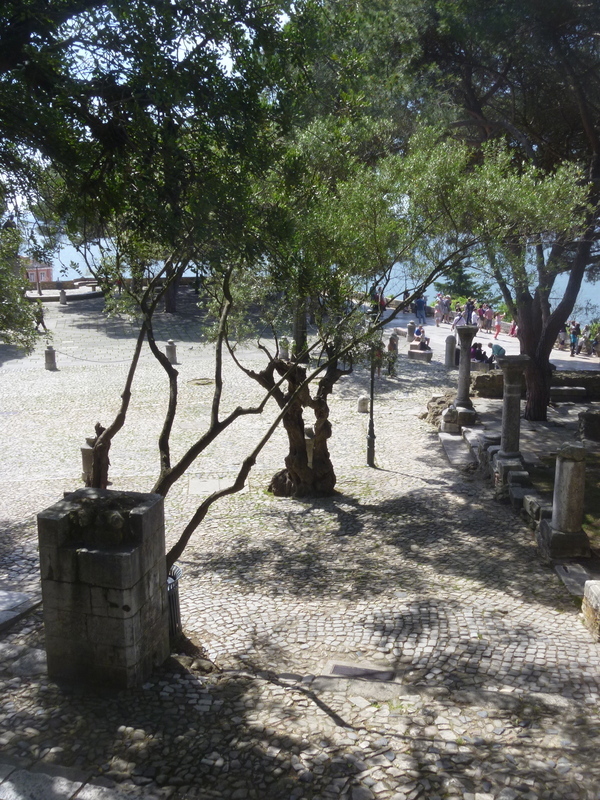 Once inside the Castle grounds you can take in fantastic city views from the busy esplanade, visit the archaeological museum, walk the battlements and see the ongoing Moorish excavations and shady gardens. 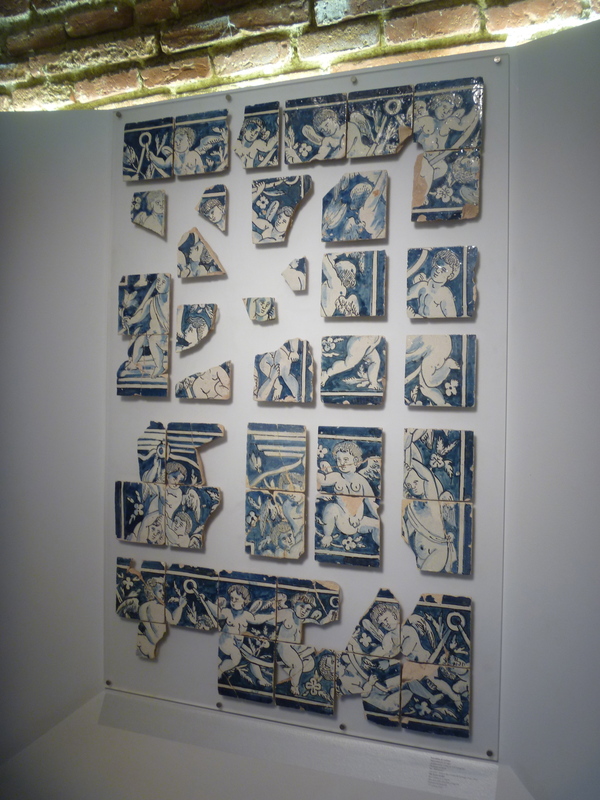 Considered to be the site of the founding settlement of Lisbon recent archaeological finds date back to the late 6th C BC. 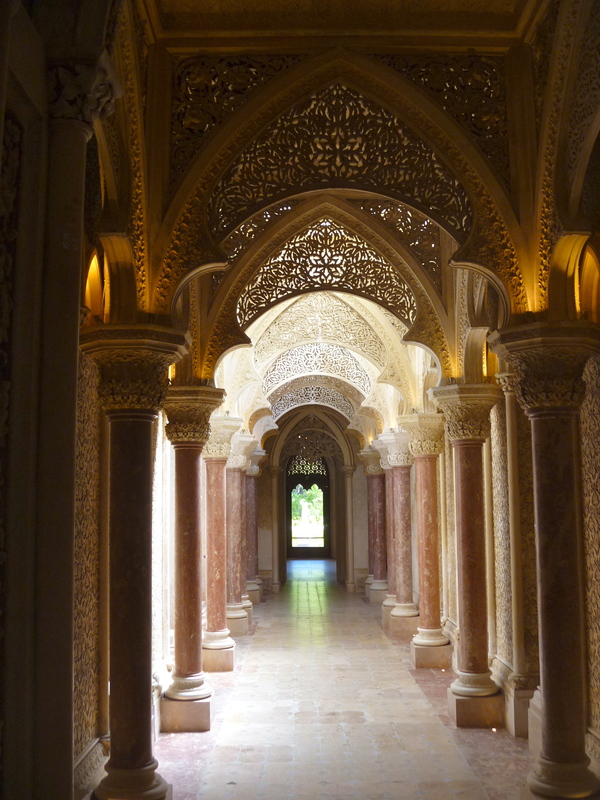 The castle remains themselves are from the Moorish era (11th and 12th C). St George’s Castle was a royal residence until 1511. For centuries then it was neglected but today it’s an attractive place to visit and we spent the best part of the morning until the early afternoon exploring and admiring the views at every turn. 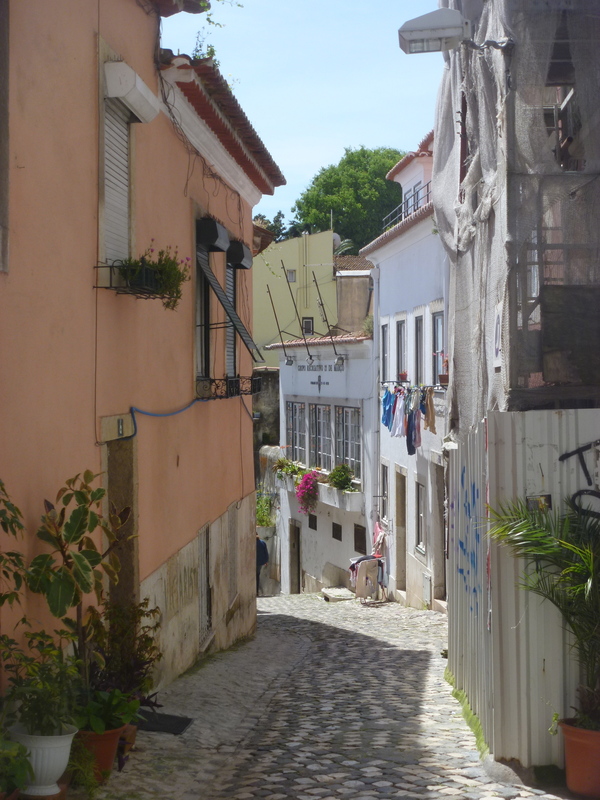 Next up was a wander around Alfama – taking note of possible evening meal locations – and ending up at the popular, Bohemian-style Pois Cafe very near Sé Cathedral the next place on our itinerary. 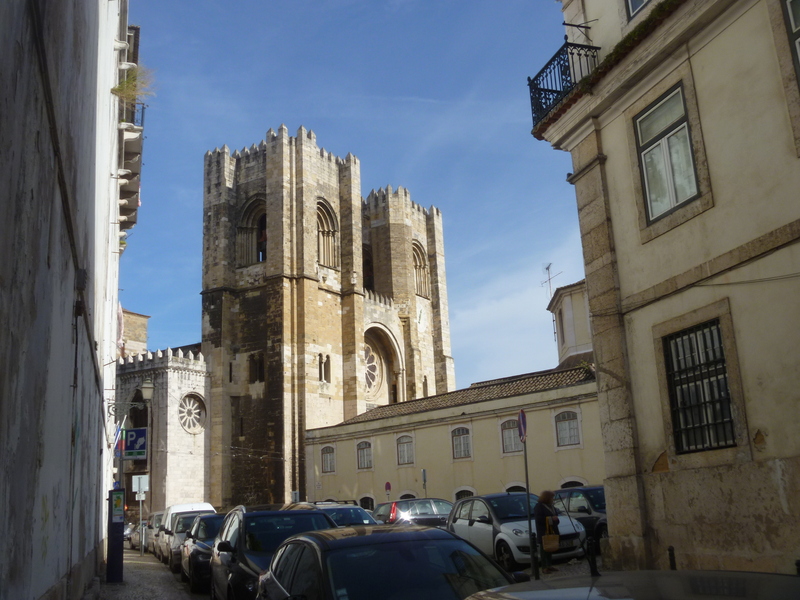 Lisbon’s Cathedral, built not long after Dom Afonso Henriques took Lisbon from the Moors in 1147, stands on the site of city’s main mosque. 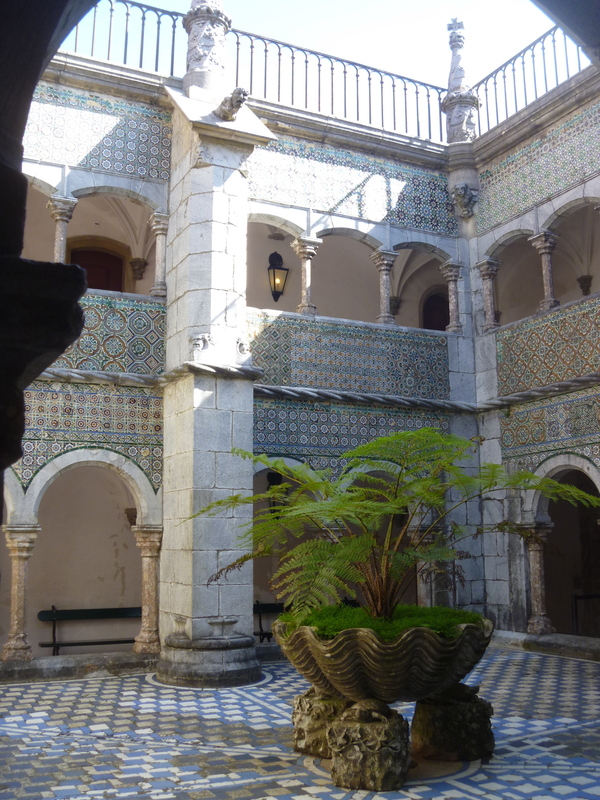 The crenellated Romanesque building is a reconstruction and restoration since most of Lisbon was destroyed by earthquake in 1755. 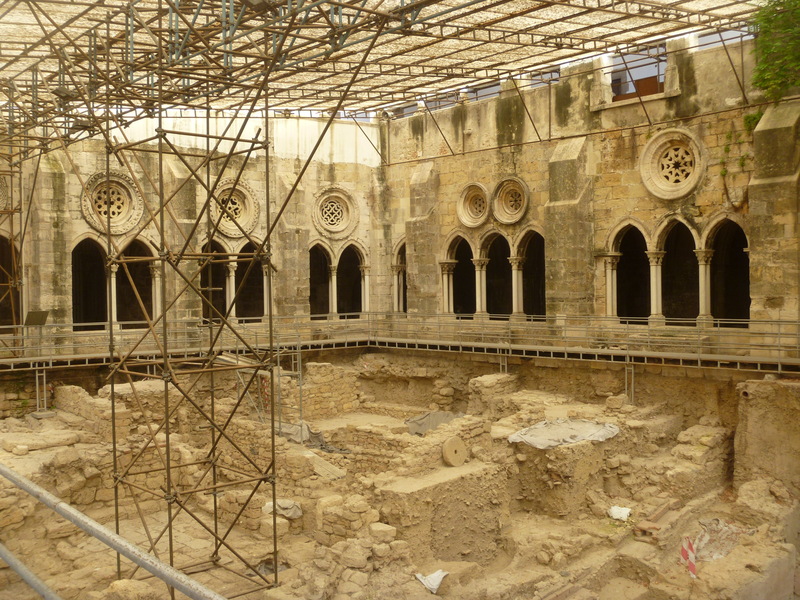 It is also an important archaeological site and new finds are constantly being added to the inventory from the cloister excavations originally started to reinforce the building’s foundations. 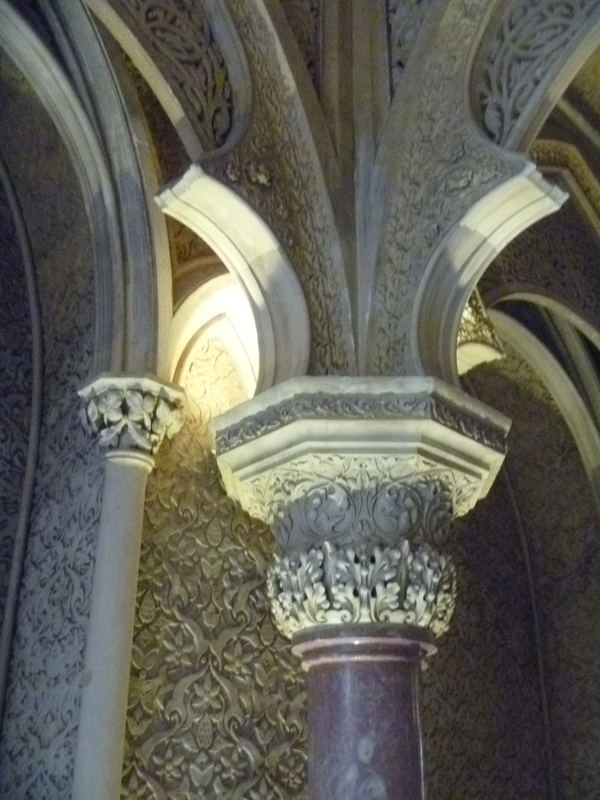 We explored the Cloister and the Treasury at extra charge. 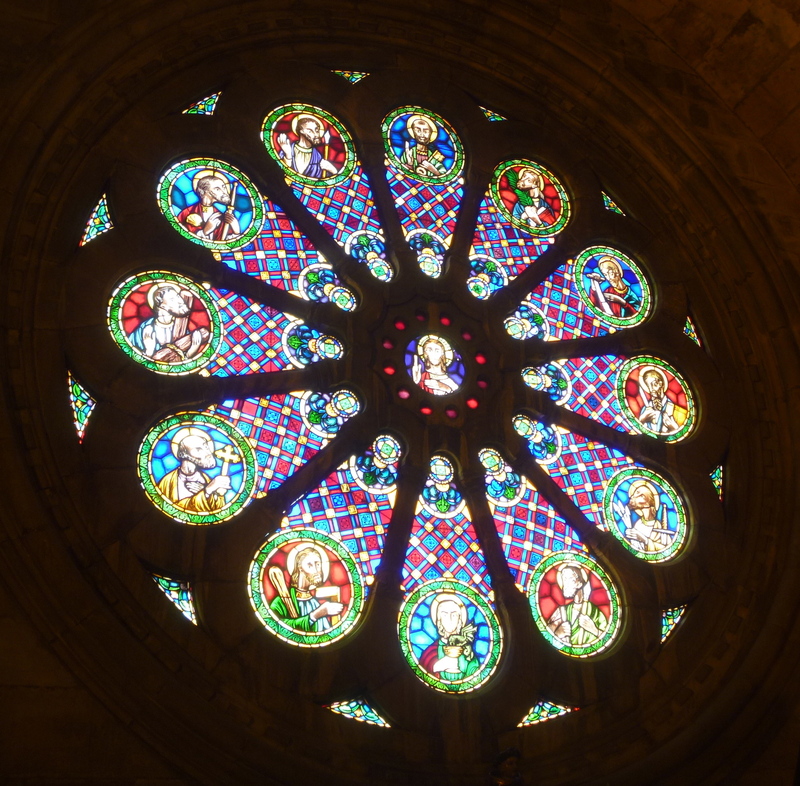 The highlight of the church is the Rose Window. 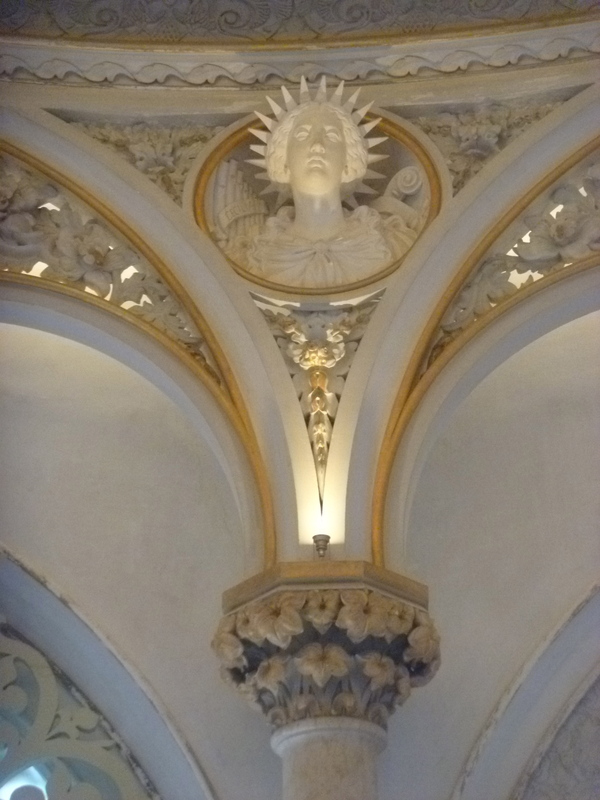 The cathedral is very dark inside and so we blinked when eventually we emerged into the sunny Lisbon afternoon. 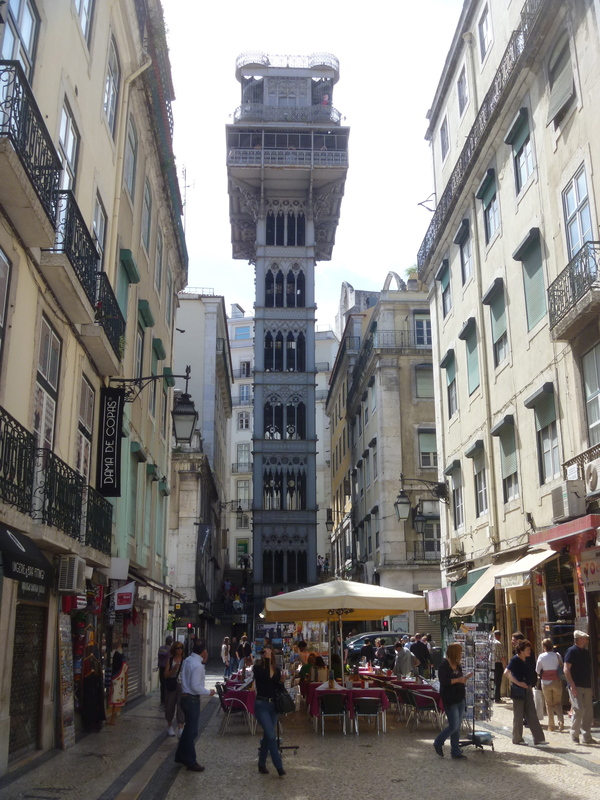 We then walked across the main shopping streets, the pedestrianised rua Augusta is the main shopping drag, to the famous Elevador da Santa Justa. This lift, designed by the Portuguese pupil of Gustave Eiffel (and you can see the connection!) 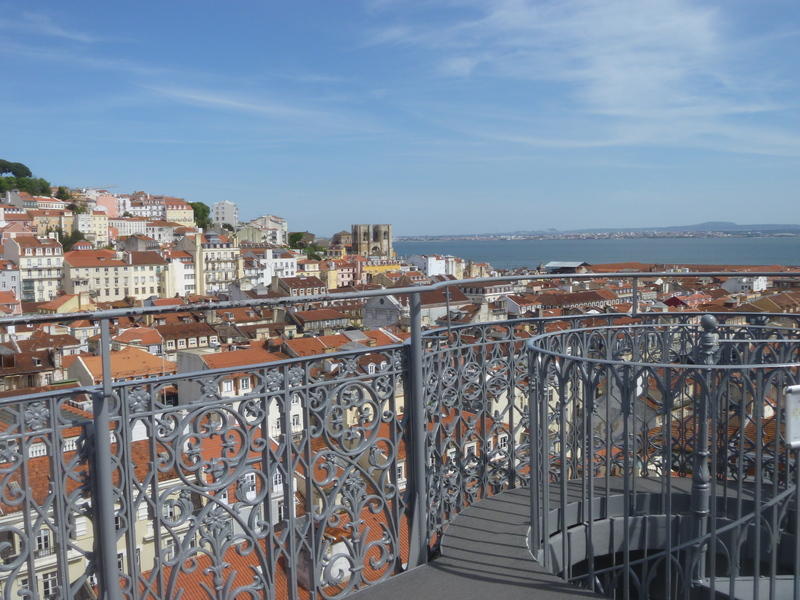 Raoul Mesnier de Ponsard, takes you up in its neo-Gothic lift to the ruin of Carmo and its busy square. When you come out of the lift there’s a tight little iron spiral staircase that takes you up to yet another amazing viewpoint. 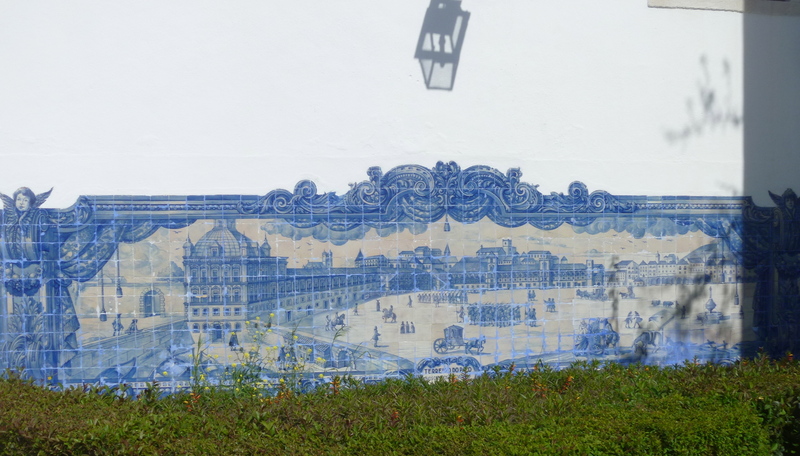 As time was tight we decided that we would have to forego a visit to Belem – highly recommended by both Teresa and Ana. 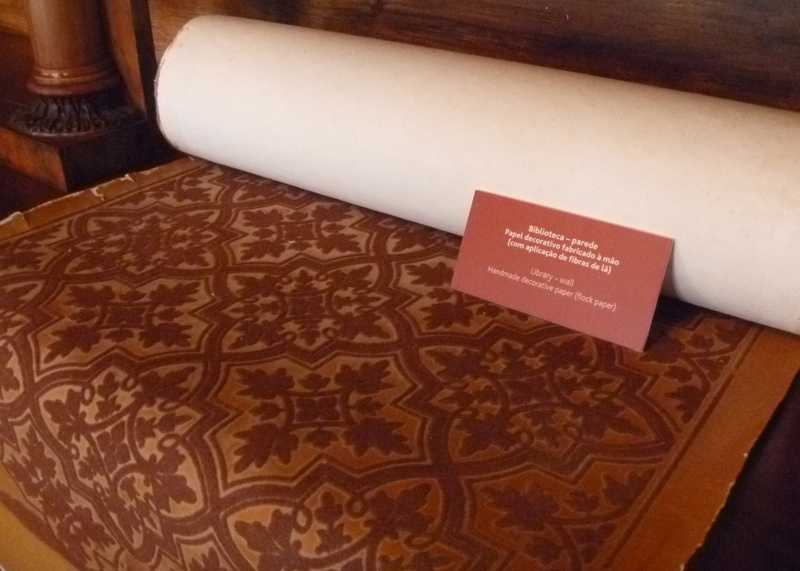 As I always say – “One must leave something for one’s next visit”. Here you will see that Lord Byron’s declamation still holds true today! 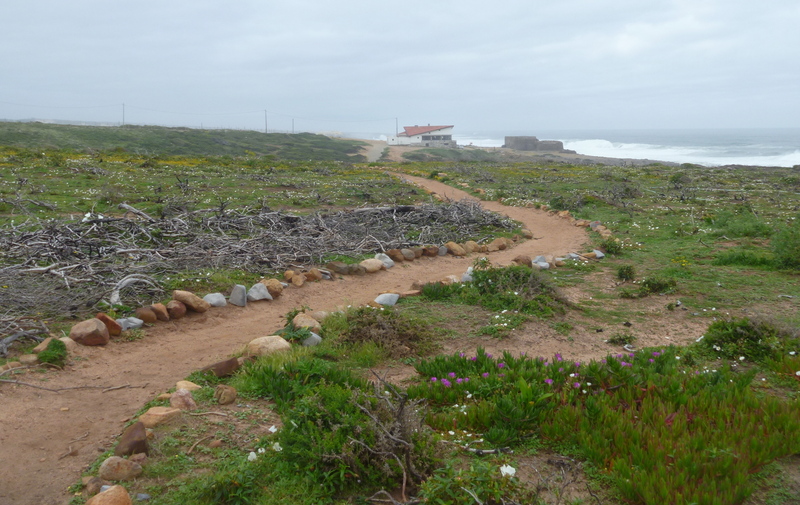 Our walk continued from Praia Grande for a further two days. 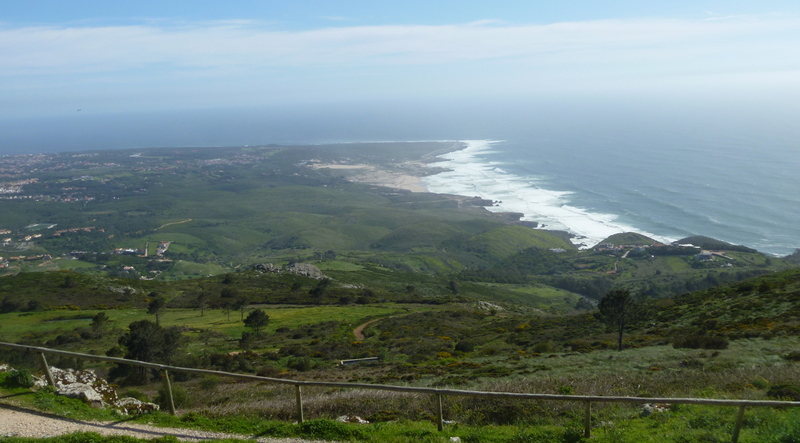 We continued up the coast as far north as Praia de Magoito where the Sintra natural park ends and then turned inland away from the ocean views to the wine growing area of Colares. 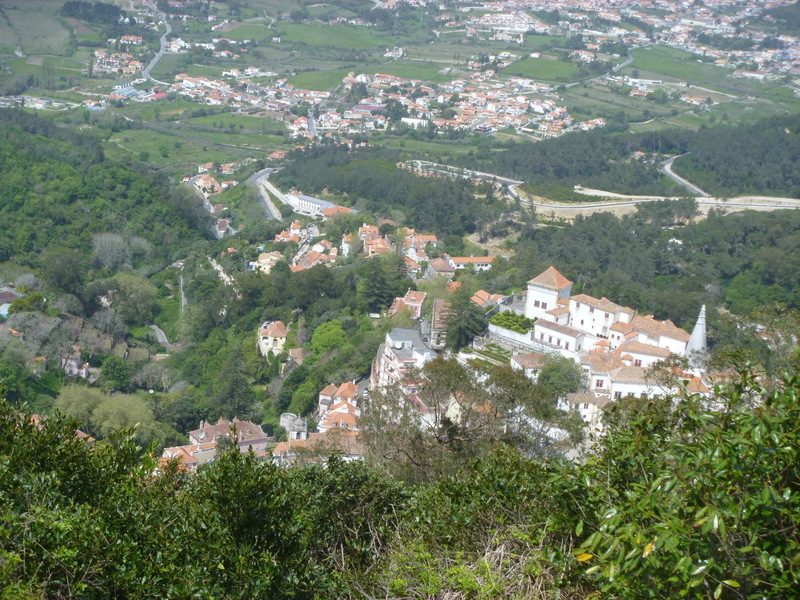 The town of Colares was where we spent the next night and our journey on foot continued the next day to Sintra itself via a long stop at the wonderful Palace and Gardens of Monserrate. 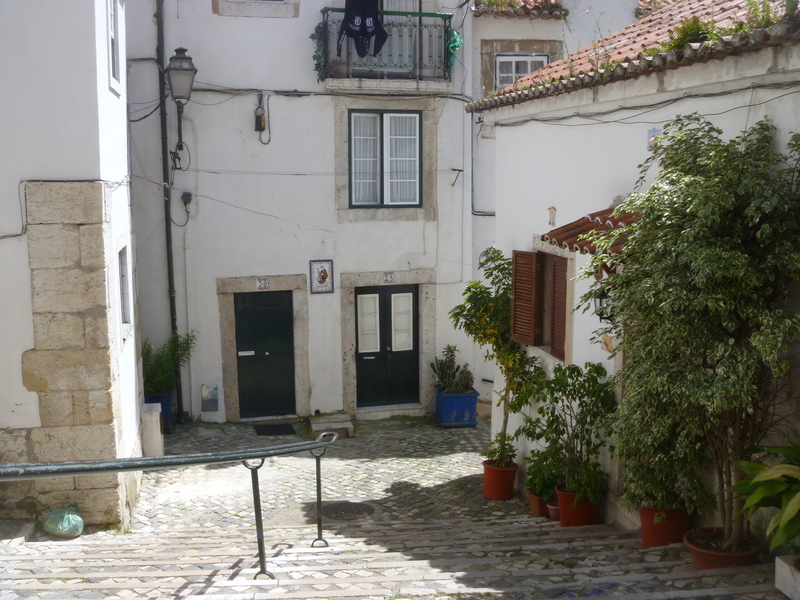 So, on the afternoon of the fifth day of walking we arrived at one of the former town gates and soon reached the famous Lawrence’s Hotel right in the old town of Sintra. 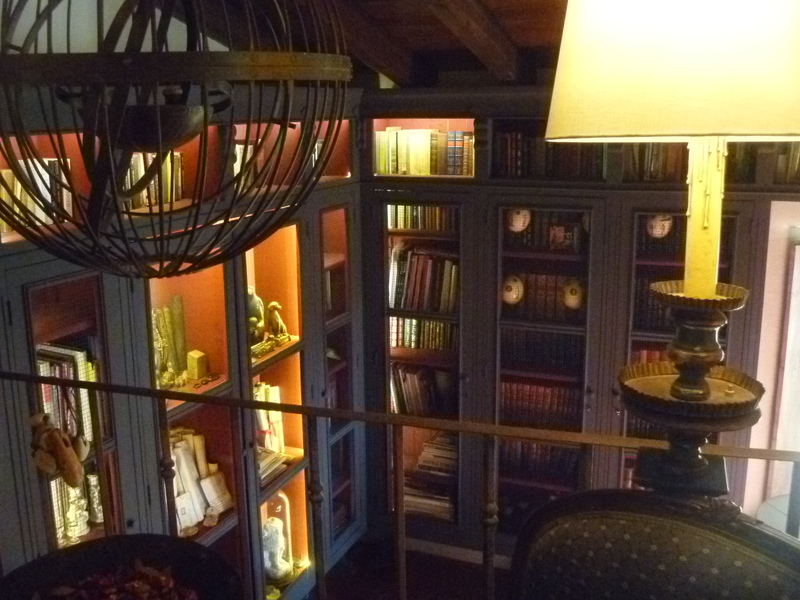 This hotel is the oldest in Spain and Portugal and (I believe) the second oldest in Europe. 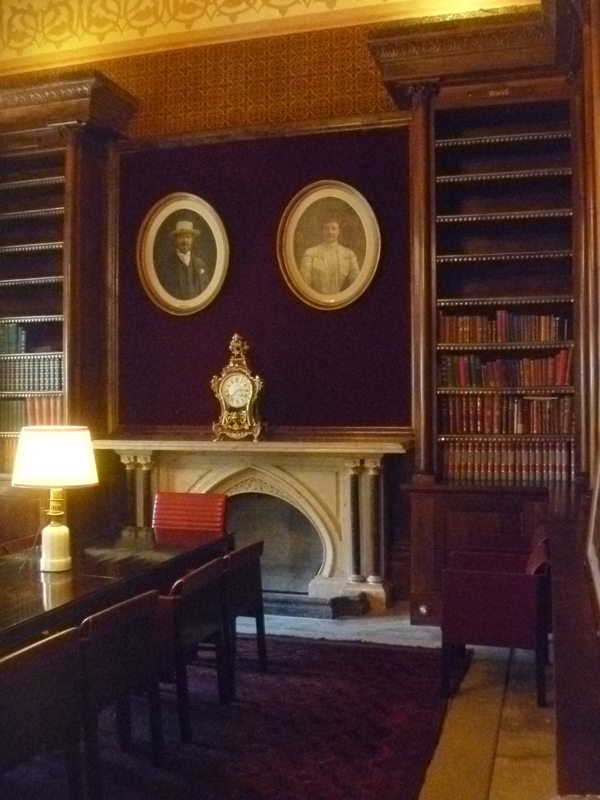 It has connections with Lord Byron who stayed here and whose portraits appear on many of the hotel and restaurant walls. 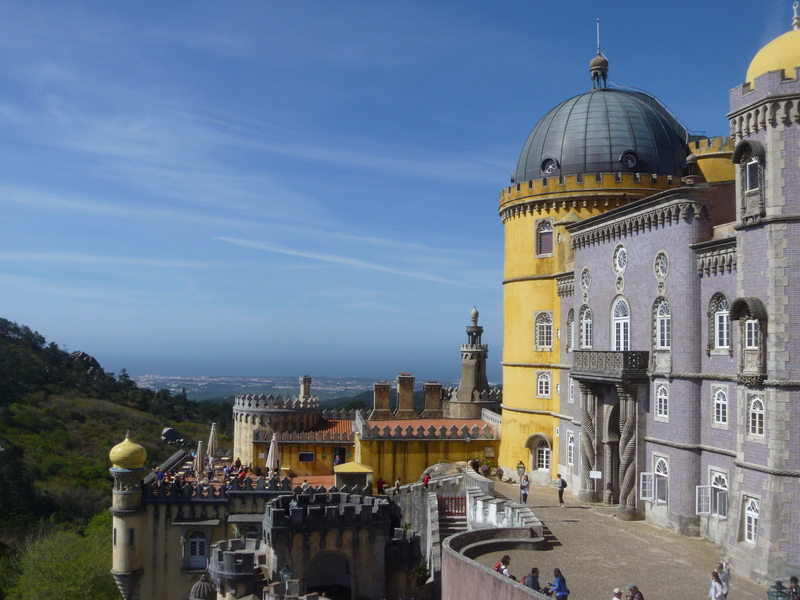 We stayed two nights at Lawrences which gave us a whole day to explore Sintra and its palaces. 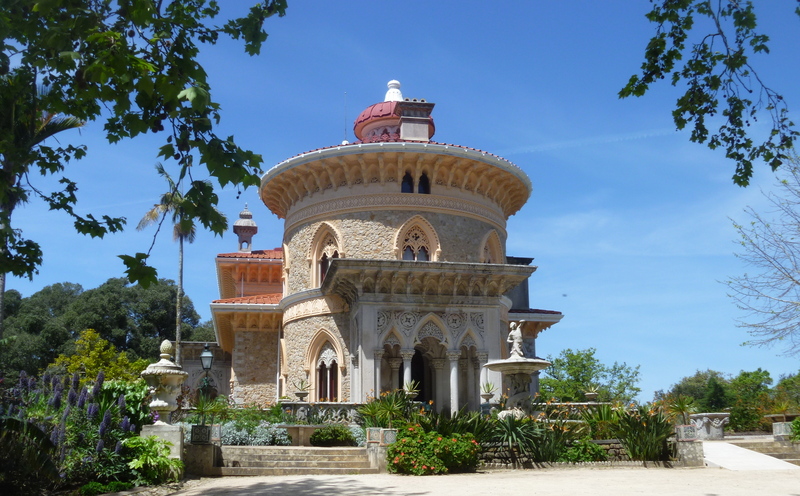 Most of our time was spent at the Park and Palace of Pena. It’s very popular; even on this Friday in April. There is lots to see in the Palace alone. 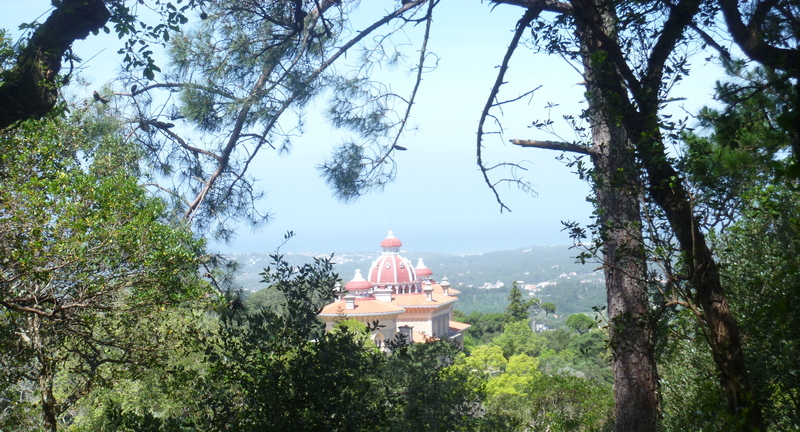 Ongoing restoration could also be observed here as at Monserrate. 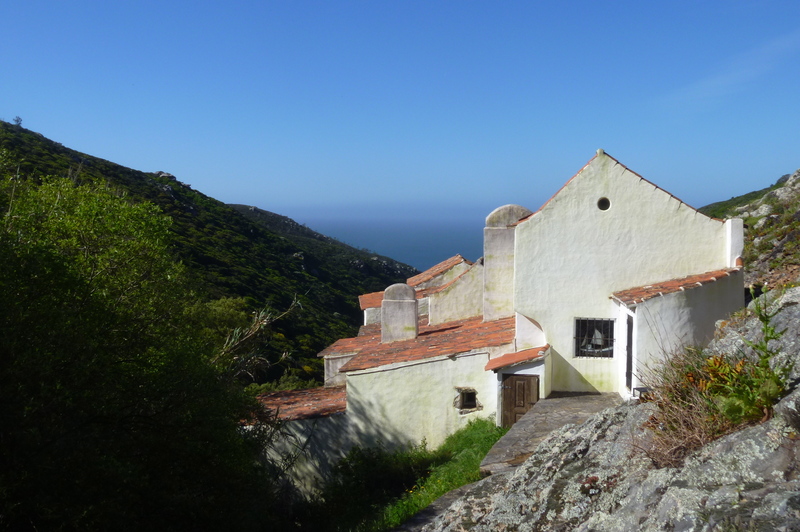 Originally a chapel and later a monastery in 1842 work began on a “New Palace” by the King Don Fernando II who left all the property on his death to his second wife the Countess Edla. The Palace and Park were acquired by the state in 1889 and converted to a museum in 1910-12. We could have spent hours in the grounds alone. Leaving the Palace you are soon away from the crowds and we decided on a route that would take in the Chalet Edla. 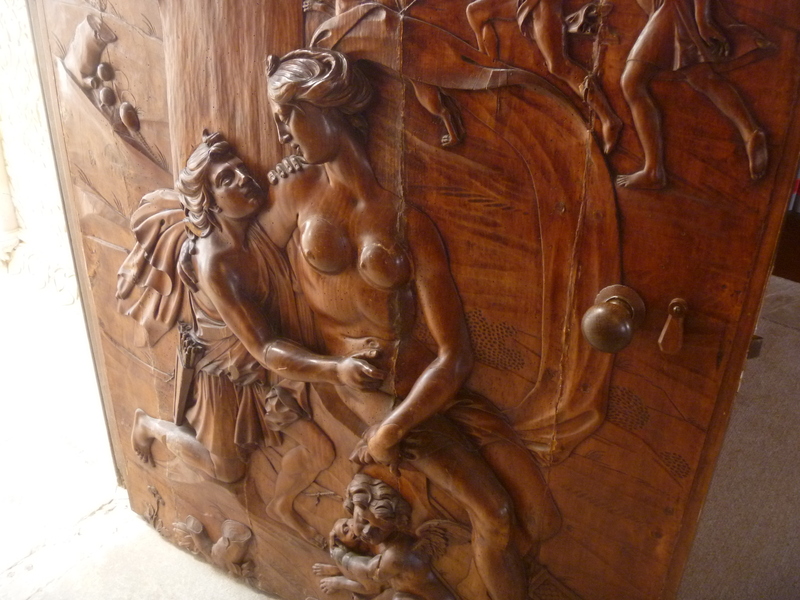 We had understood that due to damage following the storms in January the Chalet would not be open to the public. 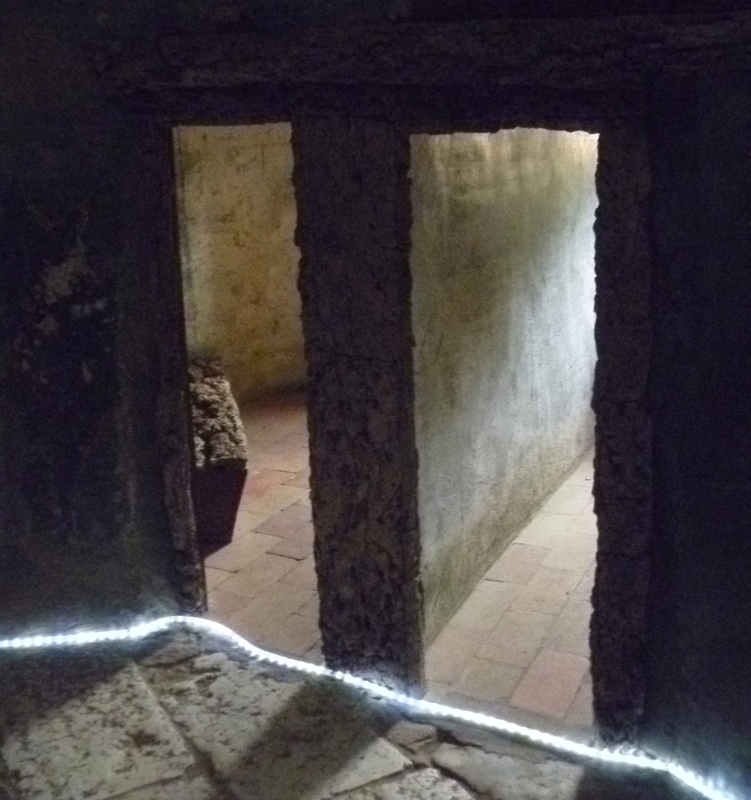 So we were surprised and happy to find that on that very day it was reopened to the public! 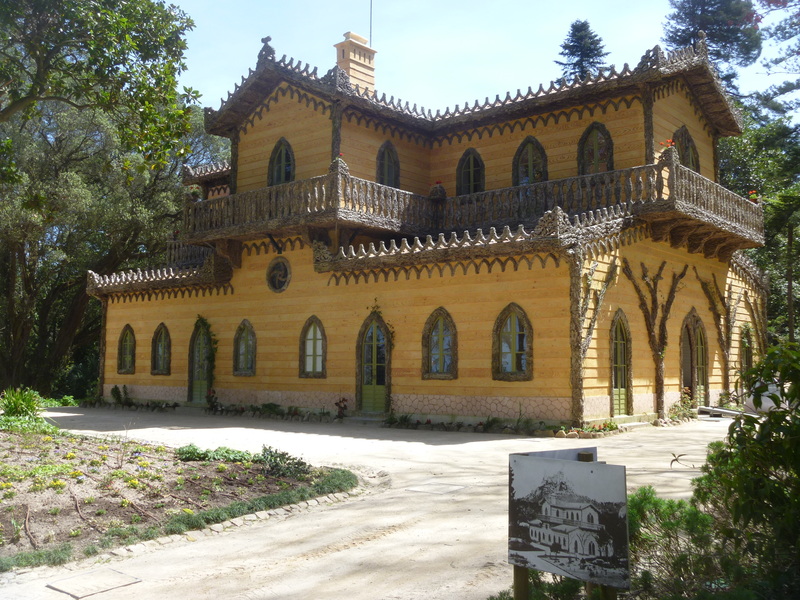 We bought our tickets and took a look round this unusual summer house built by Don Ferdinand for the Countess between 1864 and 1869. 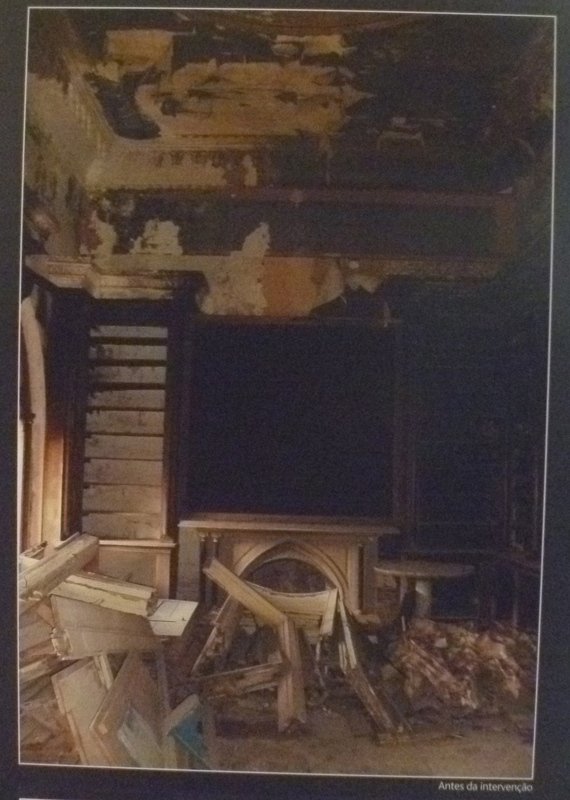 The Chalet also deteriorated badly over many years and in 1999 was damaged by fire. Here, again, renovation work is still ongoing. I’m not sure to what extent the recent storms damaged the house but there’s been a magnificent effort to restore this building to its former glory. 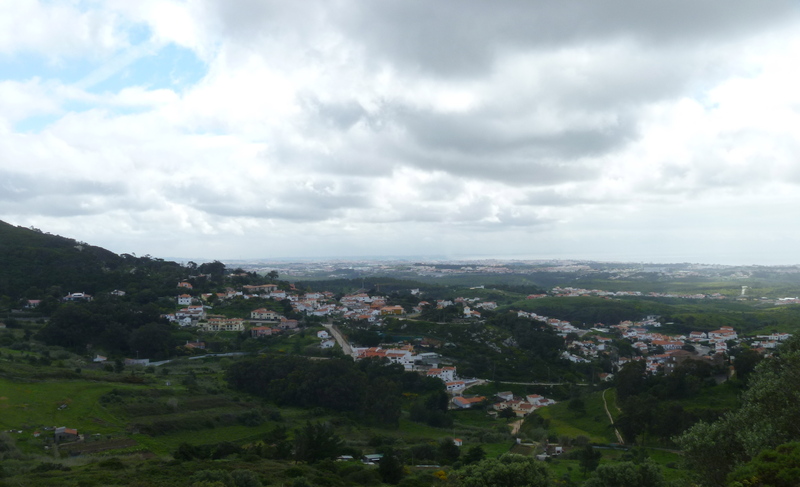 From the Pena gardens we stepped across the road to the Moorish Castle which is really just ramparts. But they are impressive ramparts. 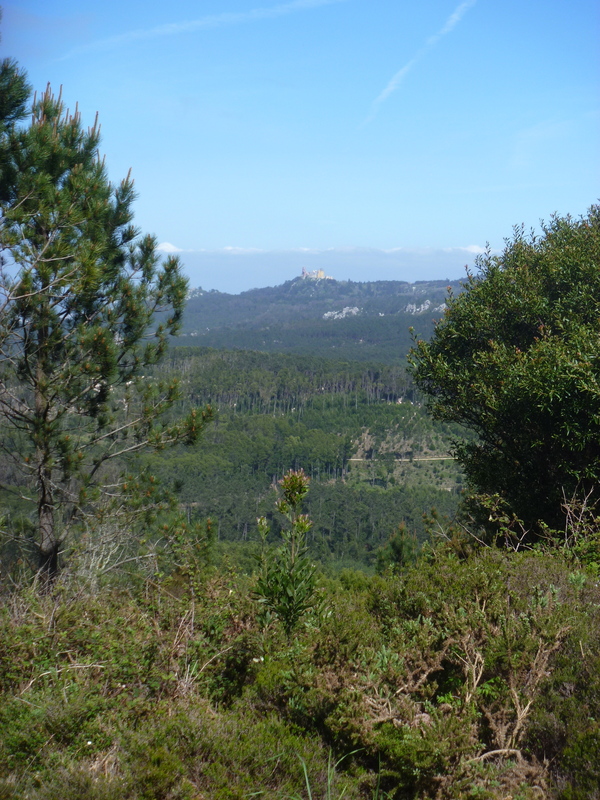 They tower over the town and we could see them from our terrace at Lawrences. 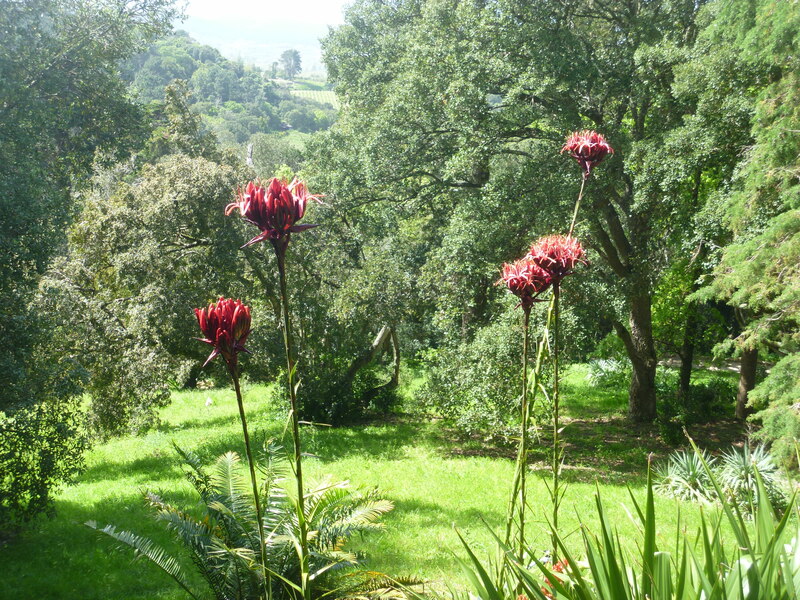 In 1995 the whole of the Sintra Region was awarded UNESCO World Heritage status and restoration of the various properties and conservation of the forests and parks continues to this day. 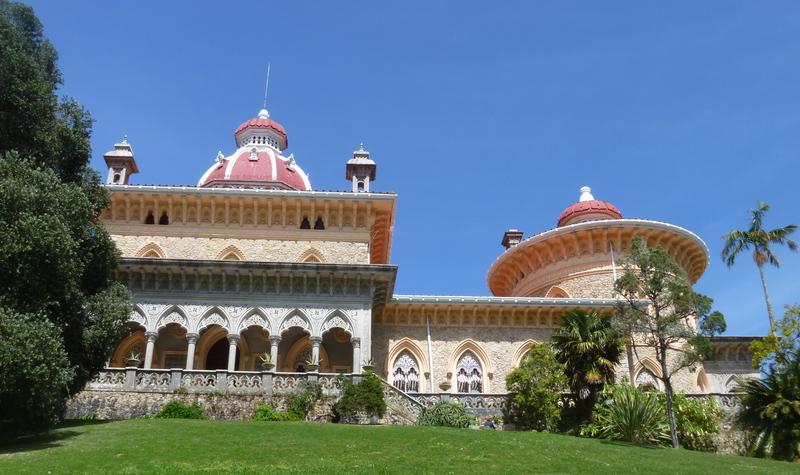 Since 1949 Monserrate has been owned by the Portuguese state. 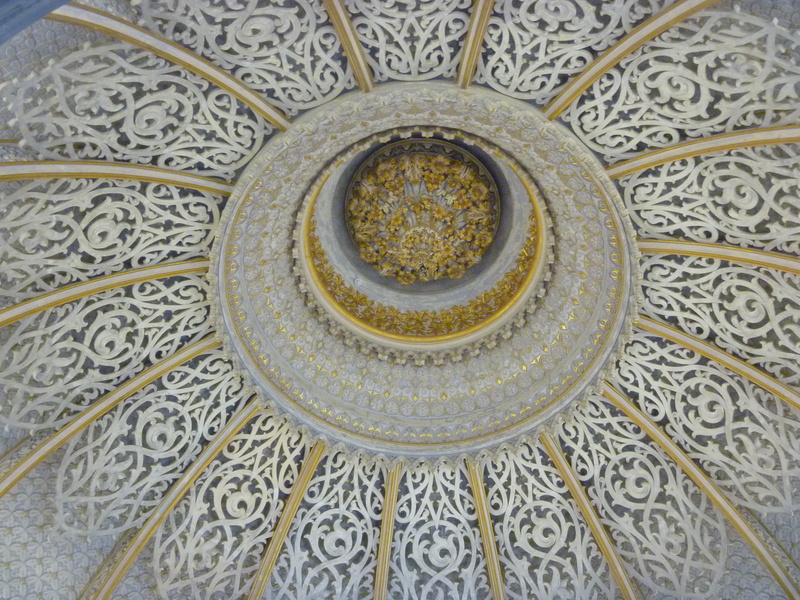 Over the decades that followed the palace deteriorated but in 2001 restoration work began on the roof and facades. After interruptions this work was finally completed in 2004 when work on the interior could begin. A successful bid for funds from EEA-Grants in 2007 enabled work to resume at a faster pace. 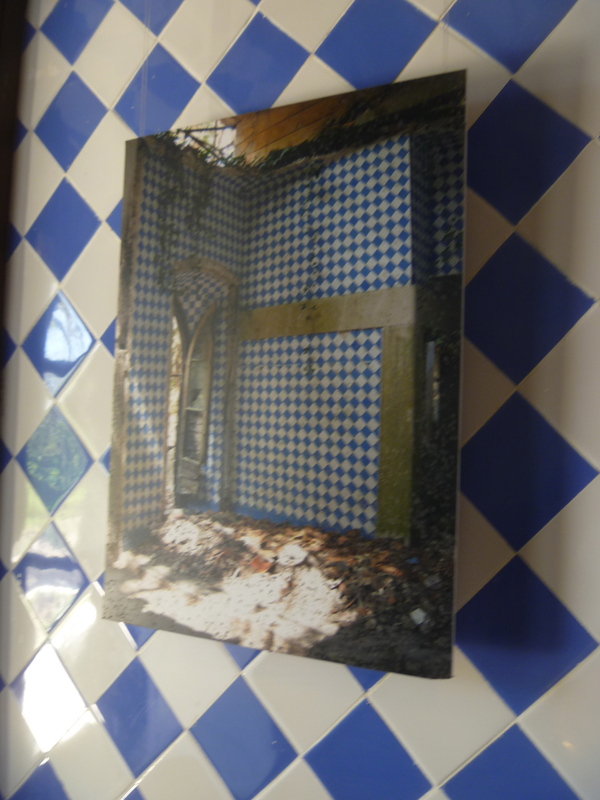 At Monserrate this the project is called “open for works” and it allows for the Palace to be open to the public so that all may watch the ongoing ‘interventions’. 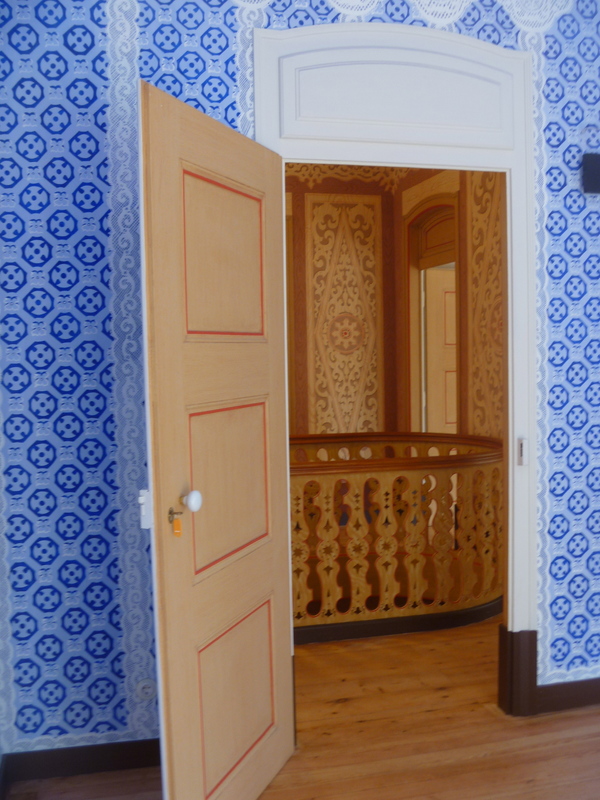 Restoration work carried out room by room allowed for the re-opening of the building to visitors. 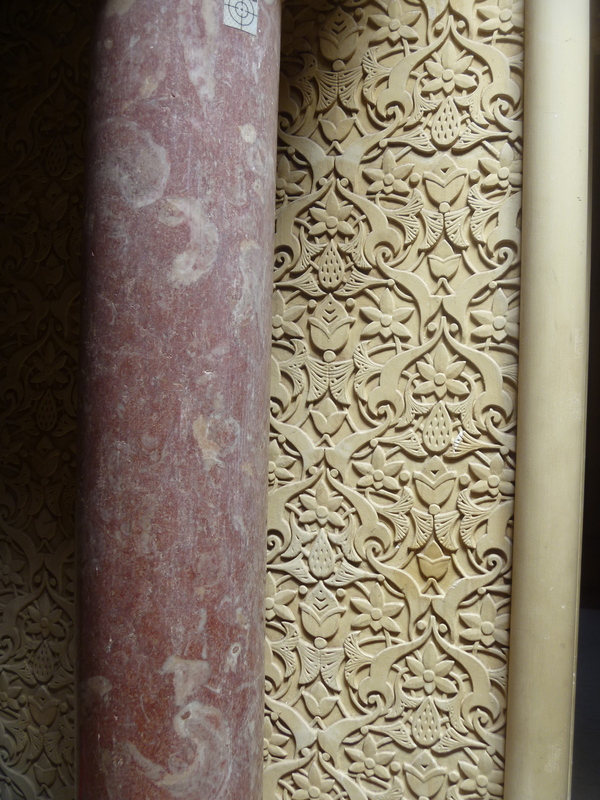 So far interventions in the Library, Chapel, Kitchen, Pantry, Wine Cellar, Larders, decorative plasterwork, cleaning of stonework, kitchen range have all been carried out in sight of the visitors. 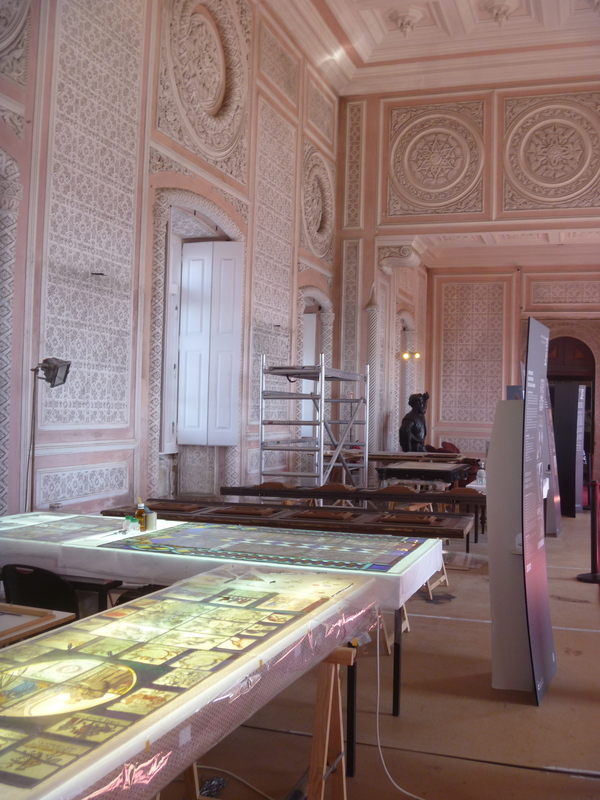 It is wonderful to see the artists and craftspeople at work and many of the rooms being brought back into use, like The Music Room for concerts. 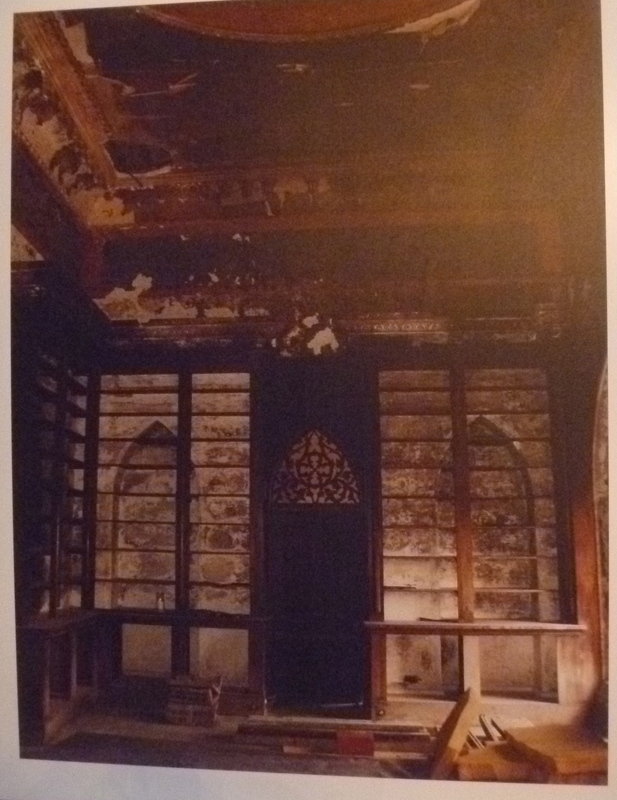 Photographs on display in the Library show just how bad the condition of this fine room became during the latter half of the 20th century. 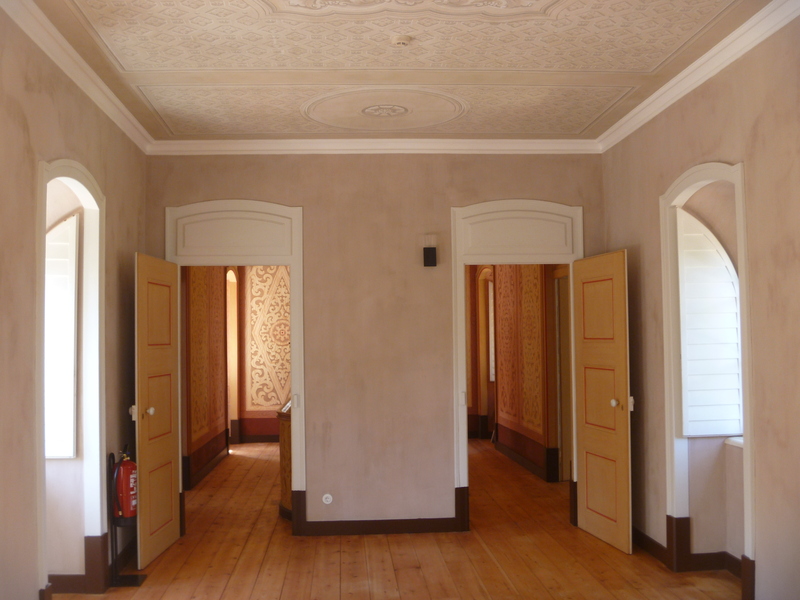 Once the roof and walls were repaired work began on the individual rooms. 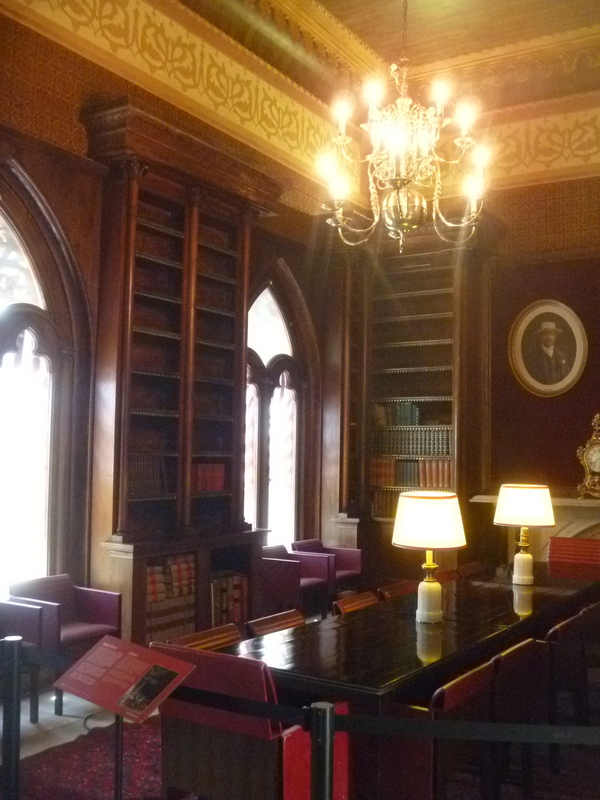 Paying careful attention to detail the Library has now been recreated in its former glory. 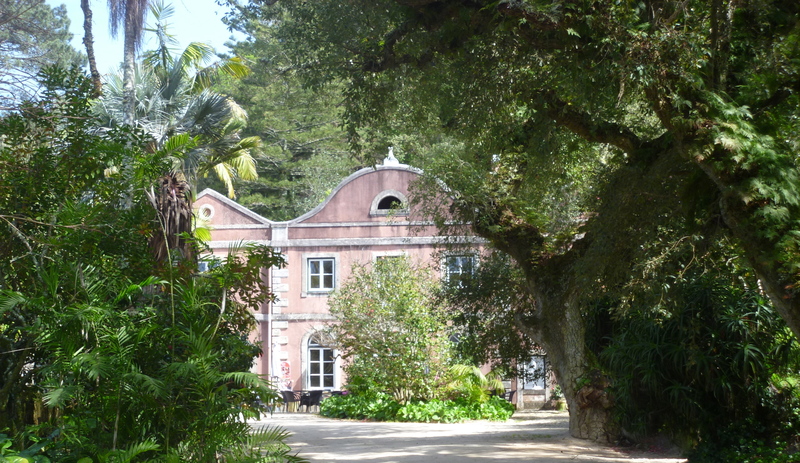 The whole project makes me surprised that The Landmark Trust do not have an interest here as it definitely has the obligatory British connections that Landmark require of their overseas holdings. 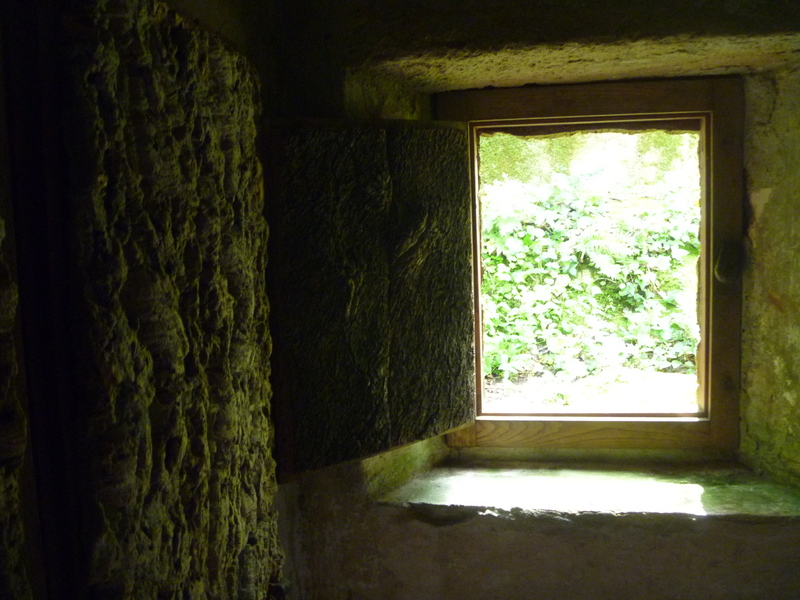 There are many follies and outbuildings ripe for occupation by we ‘Landmarkers’. Yet ruined splendour still is lingering there. I think the above verse applies to the beautiful palace and gardens of Monserrate. 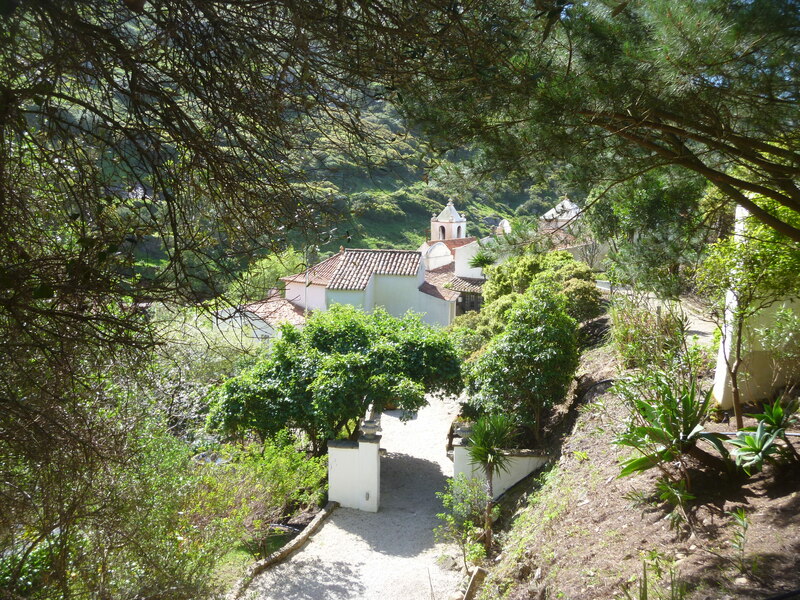 At least we were told in numerous books and leaflets that Lord Byron was smitten by Monserrate on his visit here in 1810 and reminisced about it in his poem ‘Childe Harold’s Pilgrimage’. Monserrate was probably my favourite place of the whole trip. 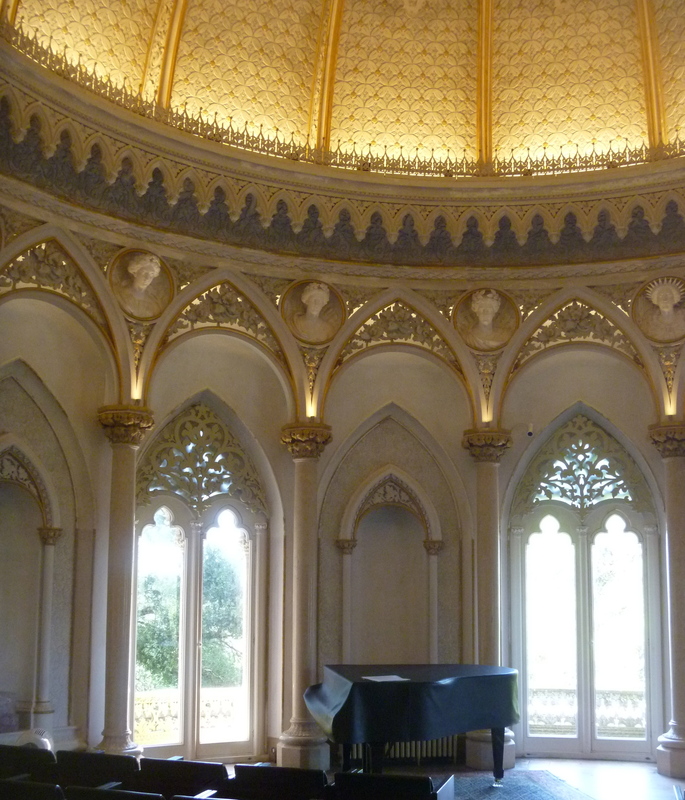 It had everything: a palace with a library, exotic gardens(but with an English Rose Garden), a tea house, British connections, literary connections and to top it all we visited in beautiful weather! 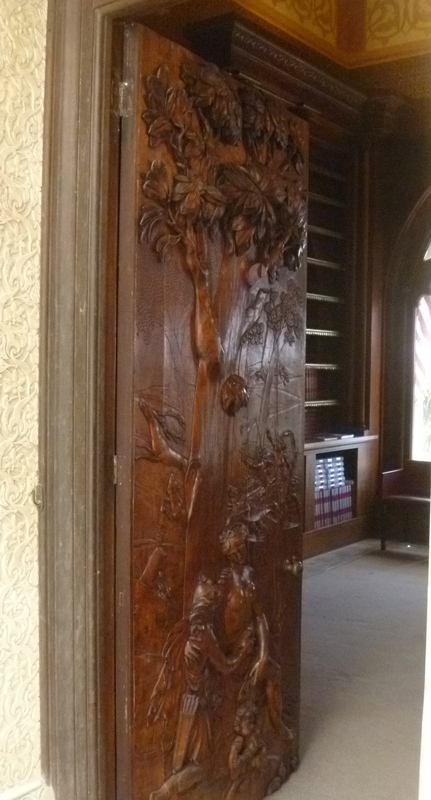 Gerard de Visme an English merchant holding the concession to import Brazilian teak was responsible for the construction of the first palace. 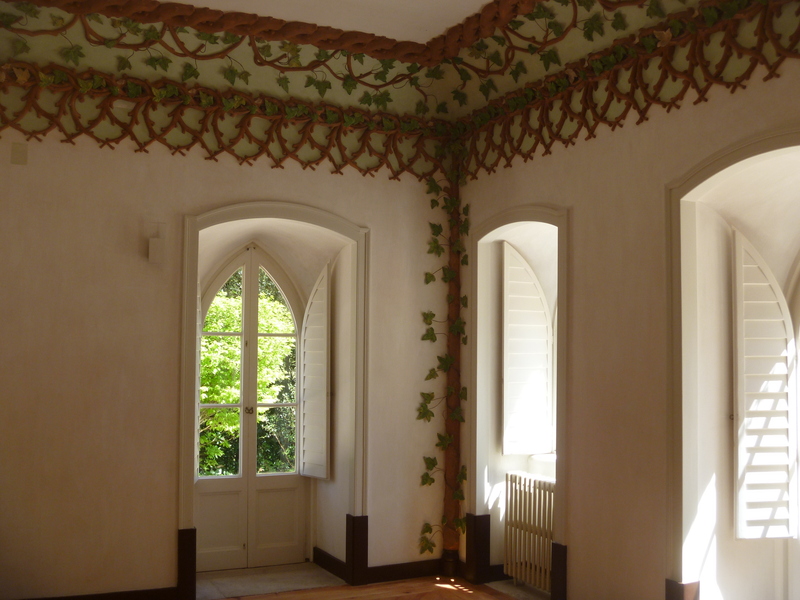 Later, William Beckford, writer, novelist, art critic and eccentric lived here. 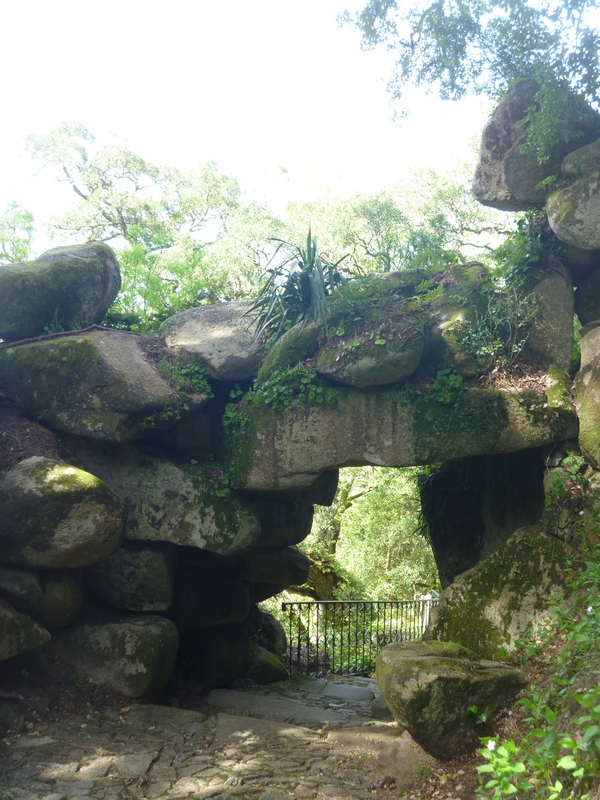 There’s a waterfall named for him and an arch for his most famous character; Vathek. Sir Francis Cooke bought the property in 1856 and had it restored by the English architect James Knowles, who employed a thousand workmen. 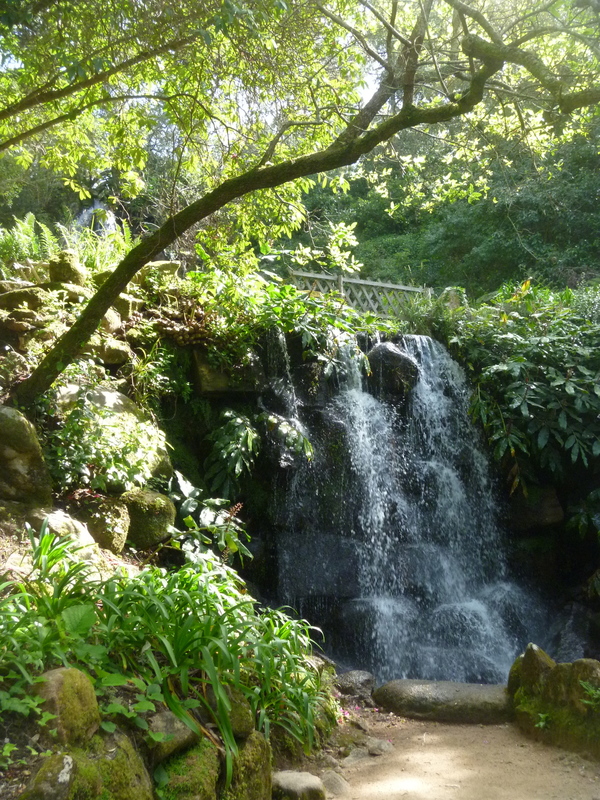 In the 1850s the artist William Stockdale created a botanic garden there with plants including rhododendrons from all over the world – Mexico, Australasia, Japan and the Himalayas. 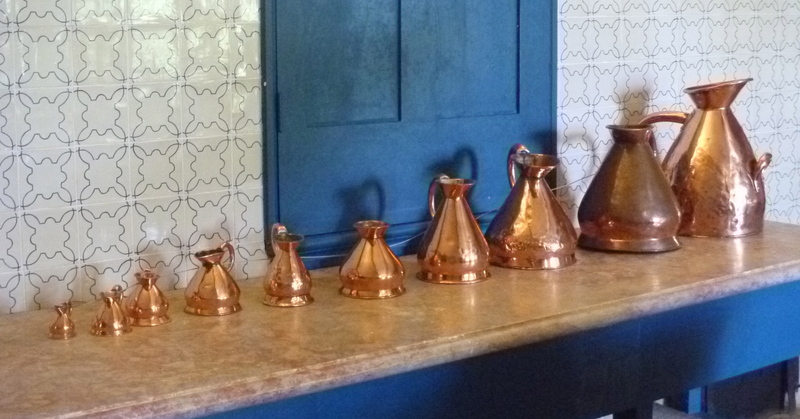 Brass jugs in the kitchen – could be Below Stairs at any National Trust property! 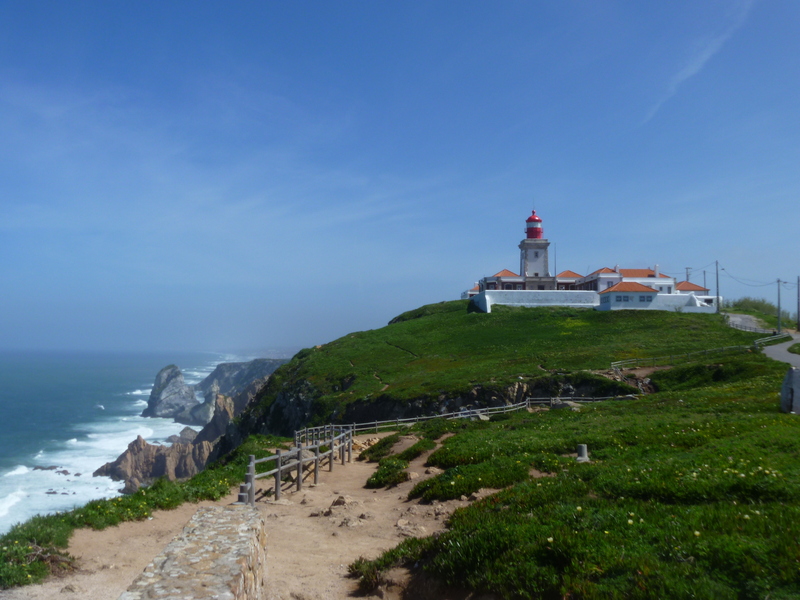 The highlight of the next day’s walking was to visit the Cabo Do Roca – the westernmost point of the European mainland. 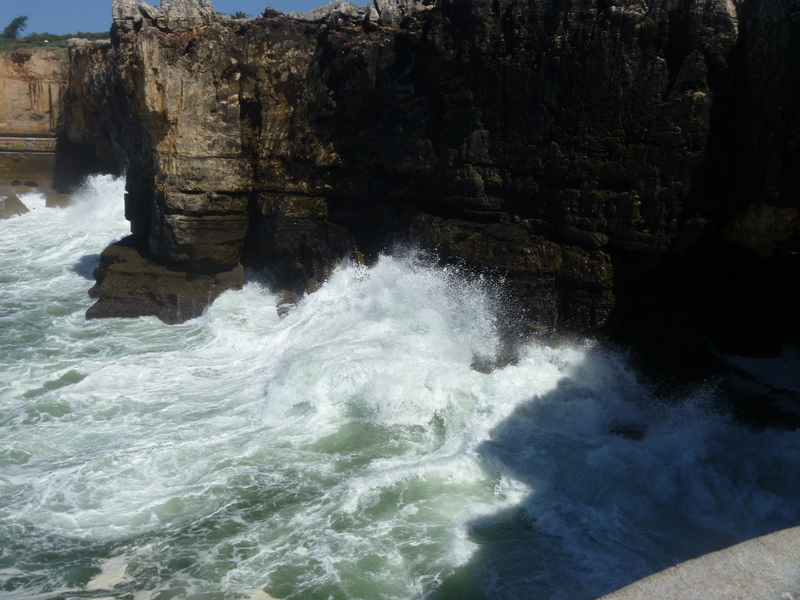 Called Promontorium Magnum by the Romans and before the Age of the Explorers was thought to be the Edge of the World. 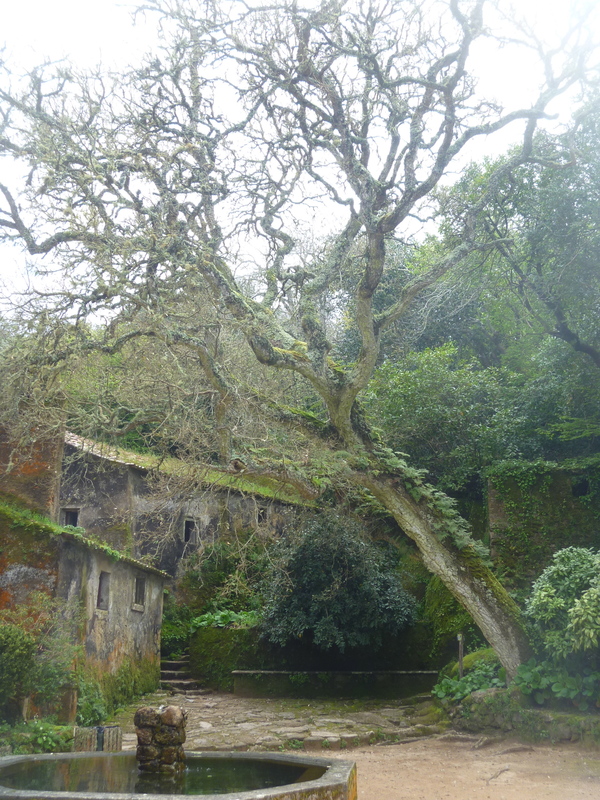 But before heading off on the next sector of our walk we spent a relaxing morning at The Sao Saturnino. 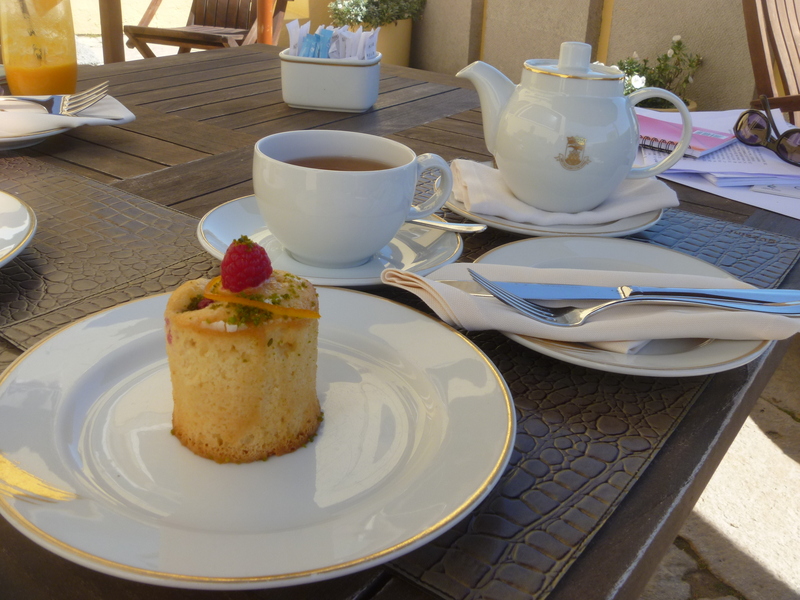 Breakfast isn’t served until after 9am and we also wanted to wander around the maze of buildings and the gardens. Here are some pictures of this beautiful location. 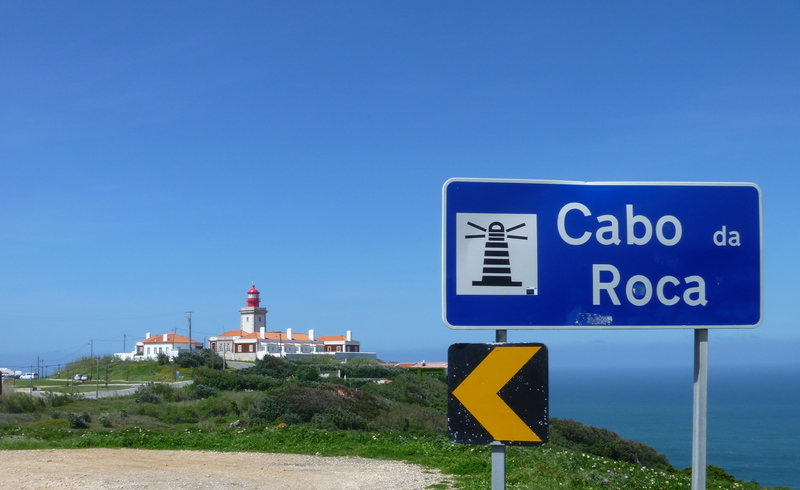 So, late morning we headed off from the Convento, through the village of Azoia, to the Cabo da Roca. 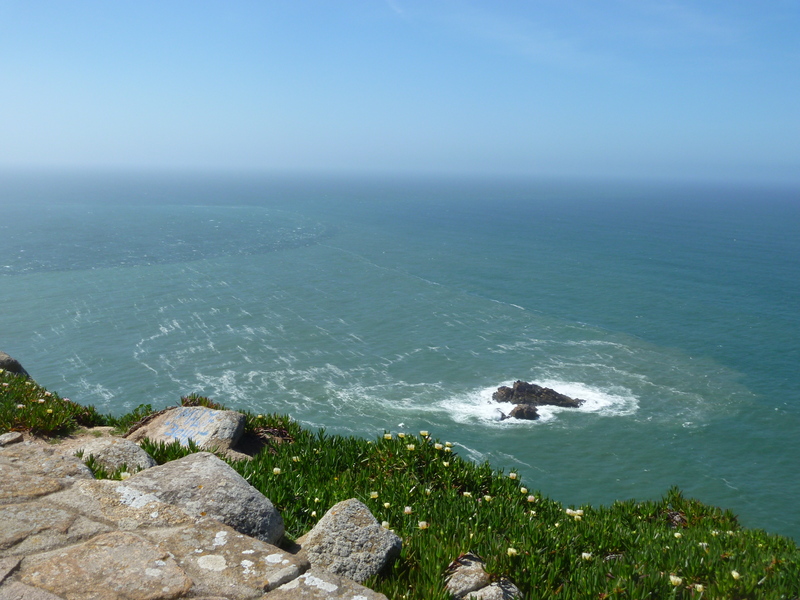 “The phrase that is most attached to this outcrop is ‘where the land ends and the sea begins’ which was coined by Luis de Camoes, the 16th century Portuguese poet.” [Route Brochure]. 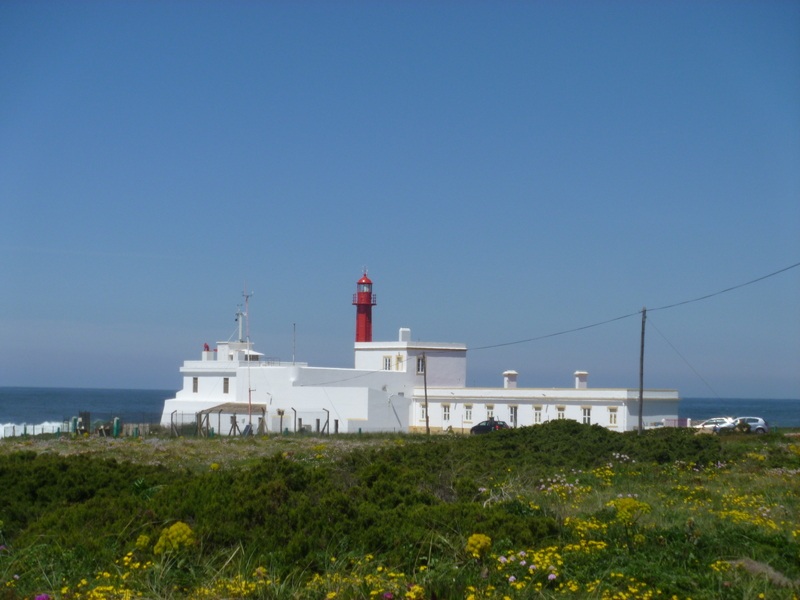 The lighthouse was built in 1772 and stands 144 metres above the cape which itself stands 140 metres above sea level. 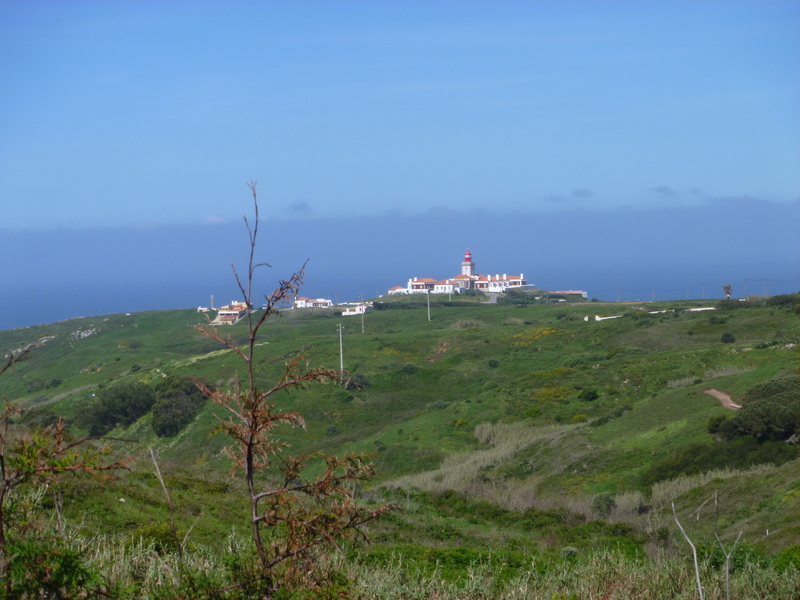 Our paths continued, with some diversions due to the January storms, mostly along the coastline to the famous Praia Grande. 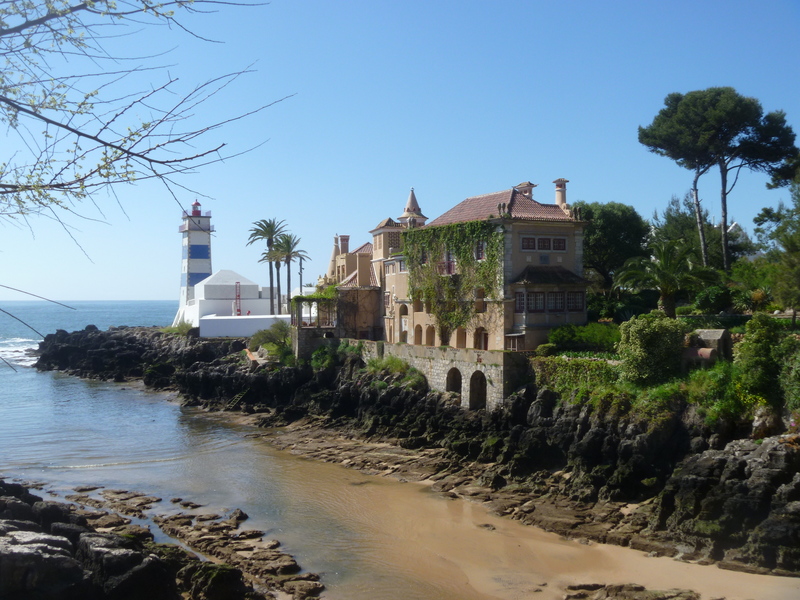 PG is one of the largest stretches of sandy beach on the Portuguese coast. 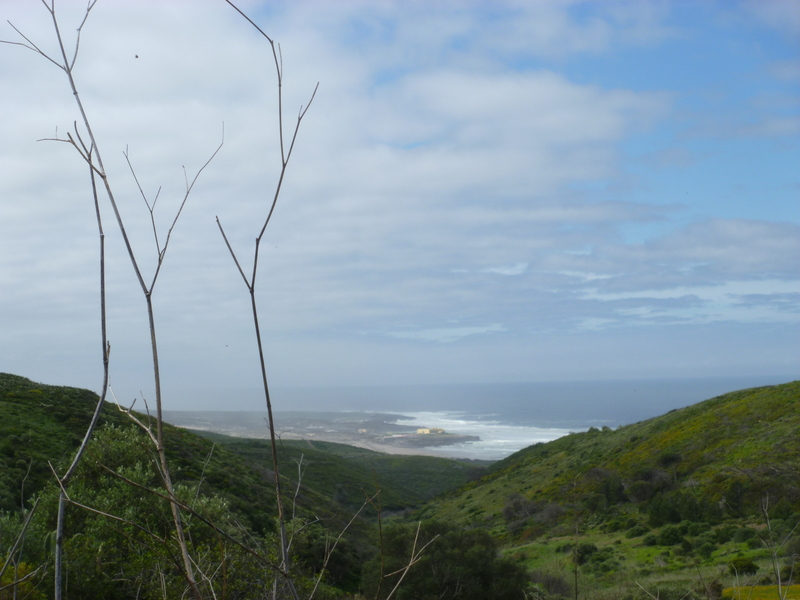 The name means Big Beach and is extremely popular with surfers all year round. 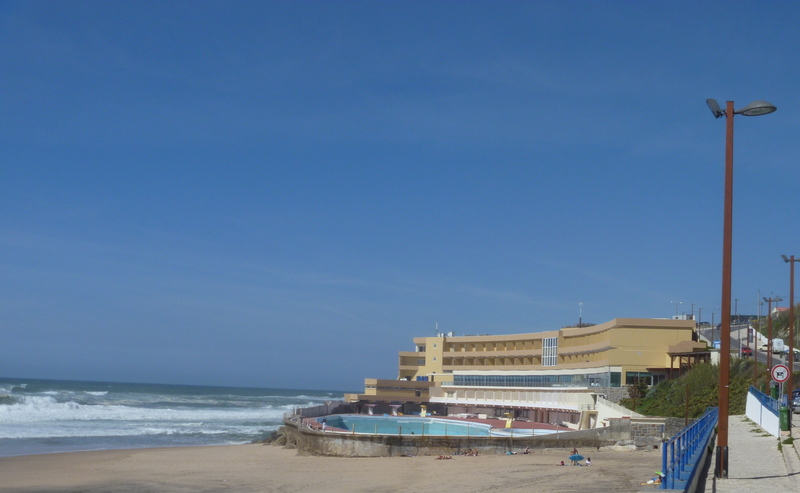 Our hotel was perfectly situated right on the beach and our room overlooked the pounding waves and the hotel’s huge 100 metre swimming pool. If our first day’s walking, now that I look back, was on a theme of Forts then the next day was on a theme of Convents. This was our longest day walking: over 12 miles. 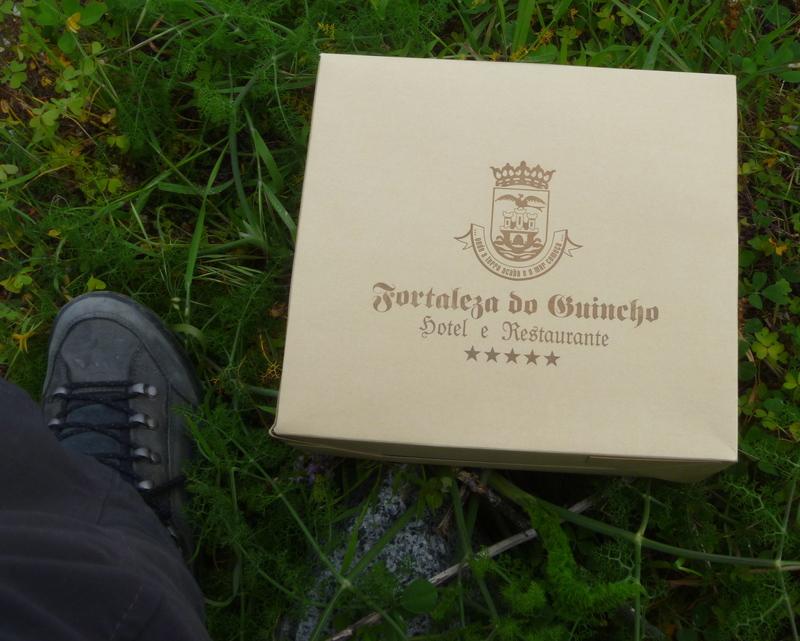 We left the Fortaleza after breakfast (and a personal farewell from the manager) at 9.30am and only arrived at our destination that evening at 6.30pm. 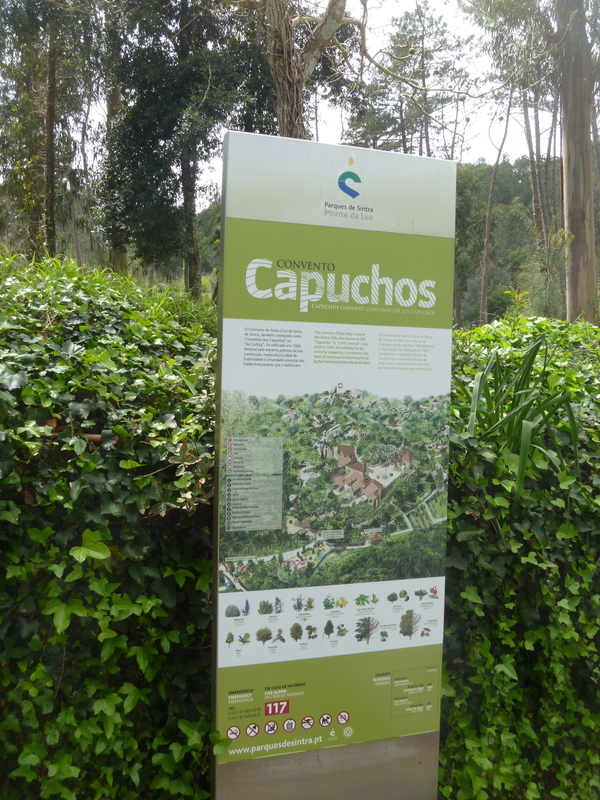 Of course, we didn’t spend the whole day walking, there were several places to visit along the way, not least The Convento dos Capuchos, where we spent well over the ‘designated’ one hour suggested in our Route Booklet. 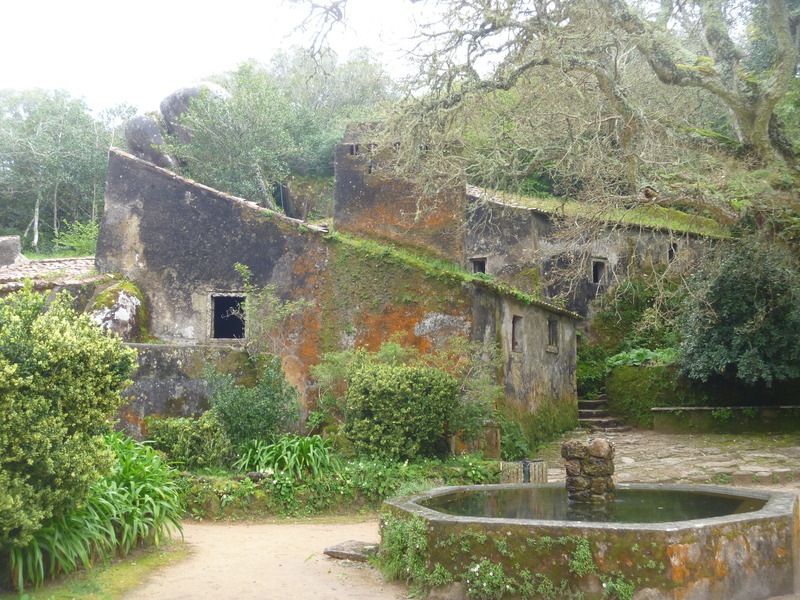 The Convento (read more about it here) was the first location within the Cultural Landscape of Sintra – a UNESCO World Heritage site first designated in 1995 – on our itinerary. 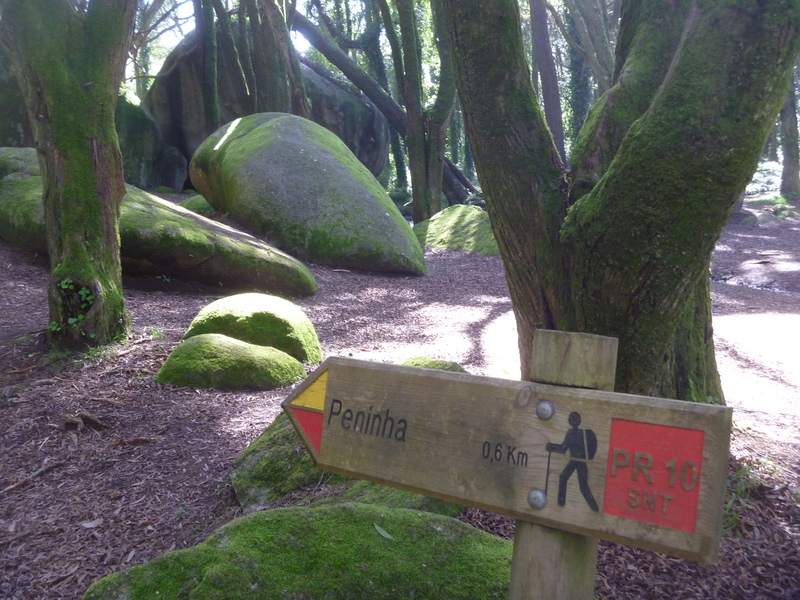 At first our route, on clearly marked paths, followed the coast northwards before turning inland and into the area known as The Serra de Sintra. There were some tough climbs but also some great views. This area was the worst affected by the storms in January this year and consequently our path was disrupted at one point. This took some time to negotiate and calls/texts to Ana but eventually we got back on track. 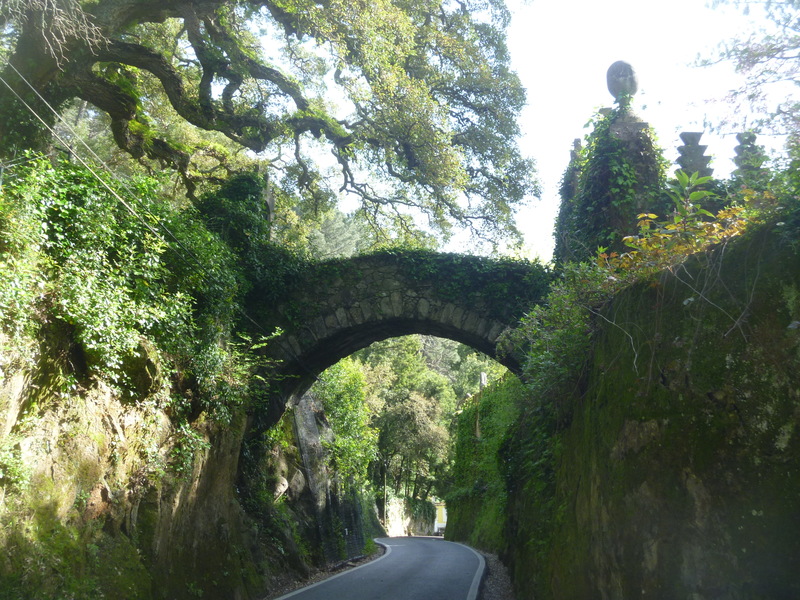 We’d hoped to reach The Convento at lunchtime but in fact we ate our picnic lunch a few miles before. Our Five Star Picnic lasted us Three Days!! 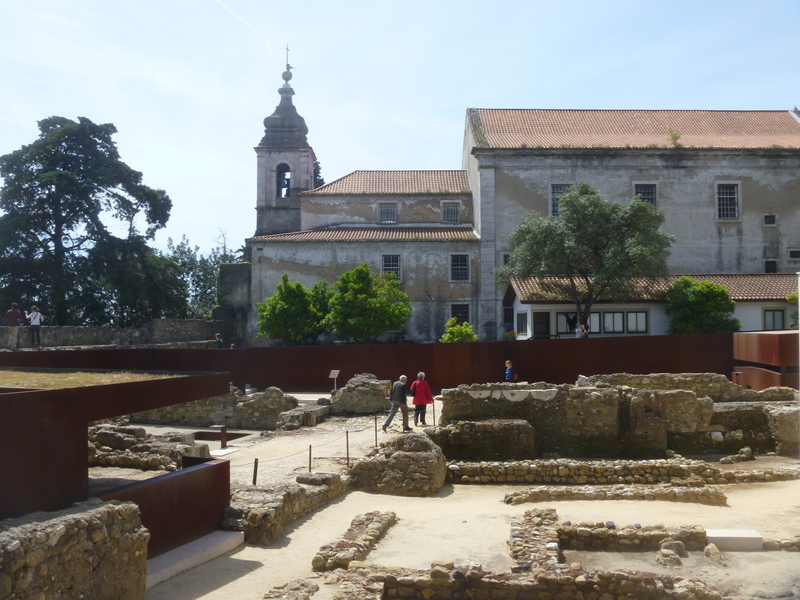 The Convento dos Capuchos dates back to 1560. 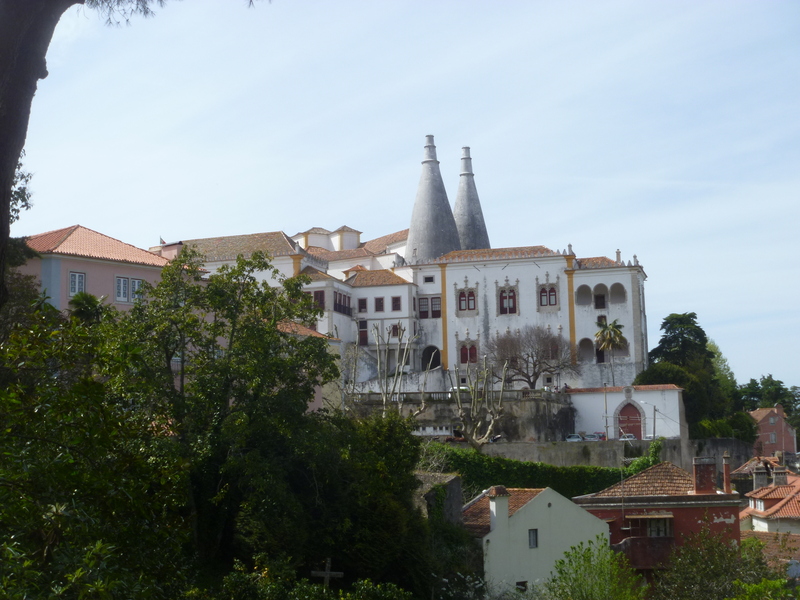 It was built by Don Alvaro de Castro as a Franciscan monastery. 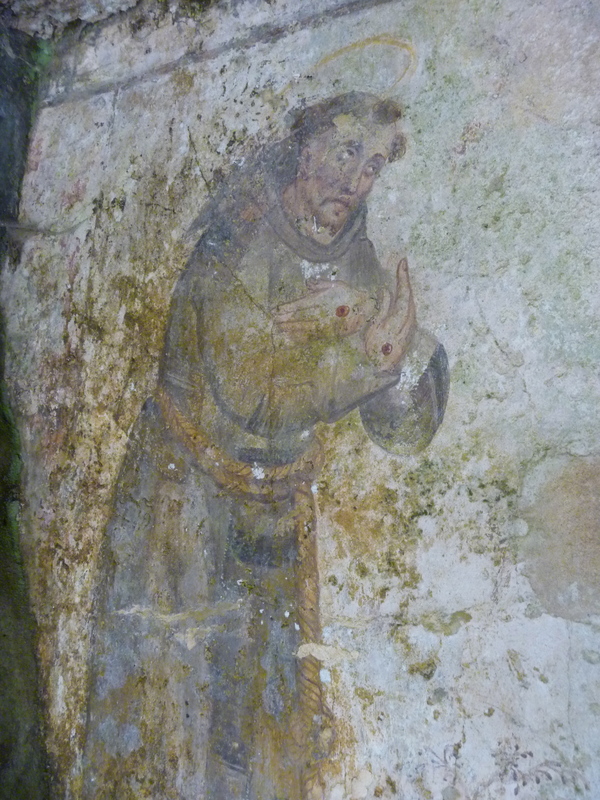 The Capuchins were a minor ‘hooded’ order. 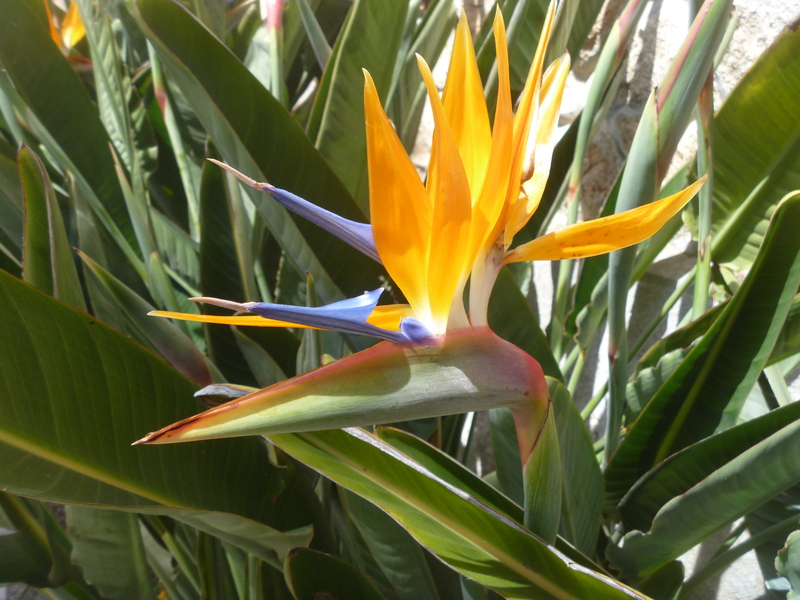 It was built in accordance with the Franciscan (fulfilling the teachings of St Francis of Assissi) principles of living in harmony with nature. 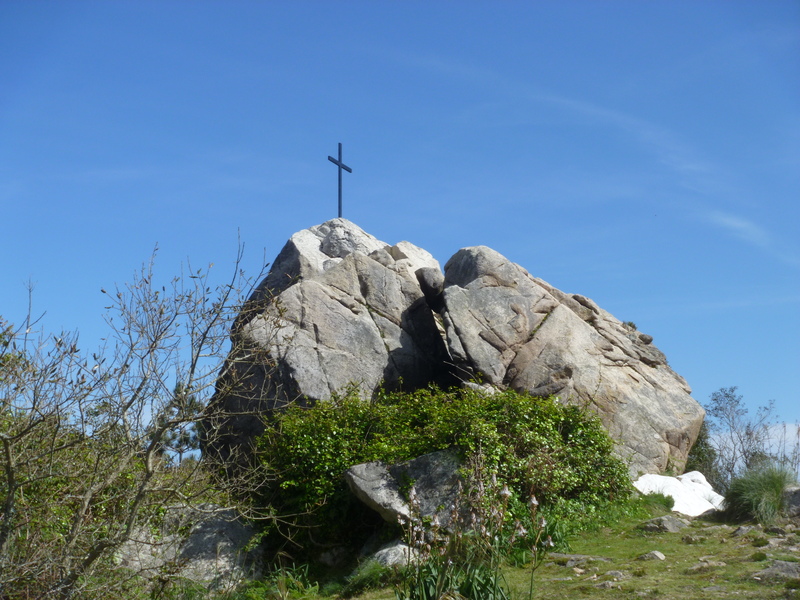 Mostly carved from the rock face, granite boulders are incorporated and cork was used as insulation, thus giving an alternative name ‘The Cork Monastery’. 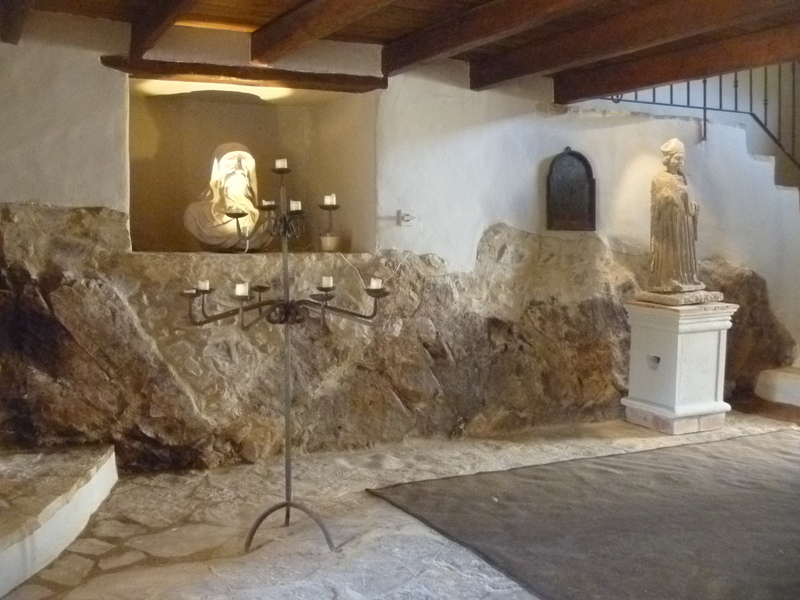 Here the monks lived a simple and holy life until the site was abandoned by them in 1834. 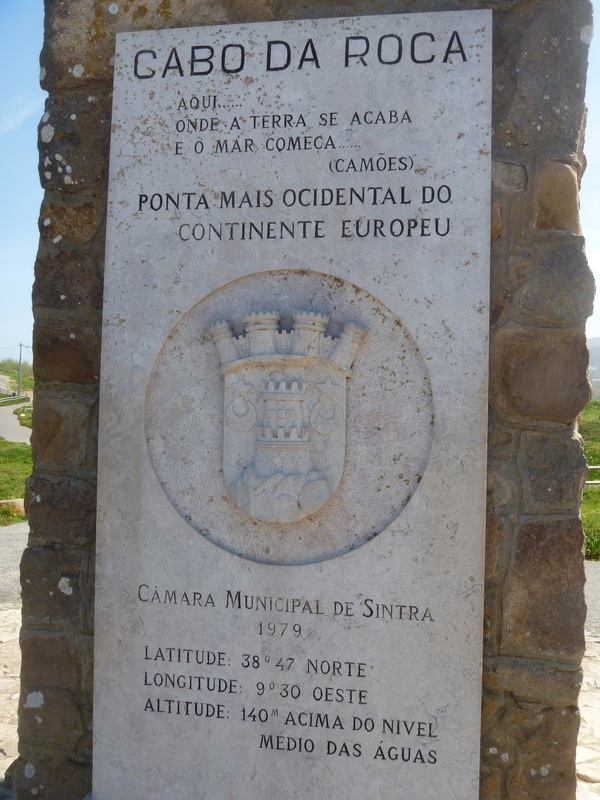 The Portuguese state took responsibility for the site in 1949. 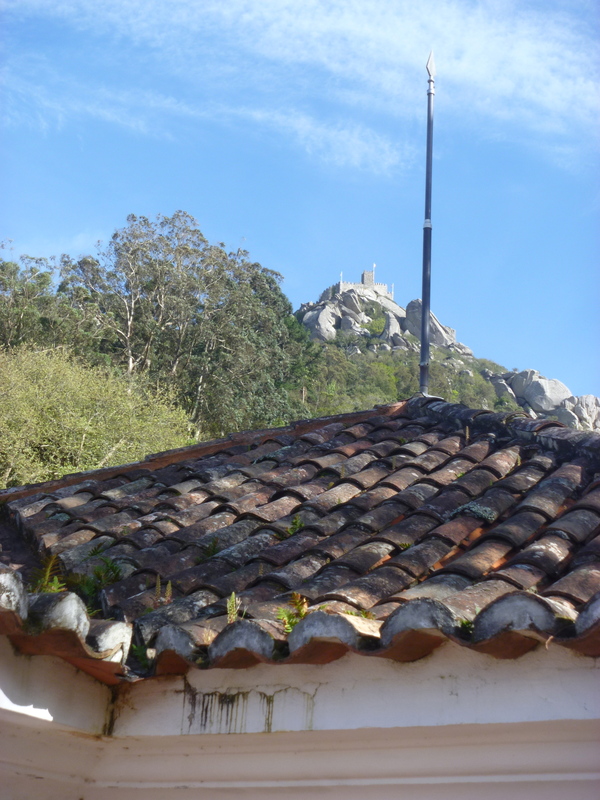 Why it is called a Convento and not a Mosteiro (monastery) I have no idea! 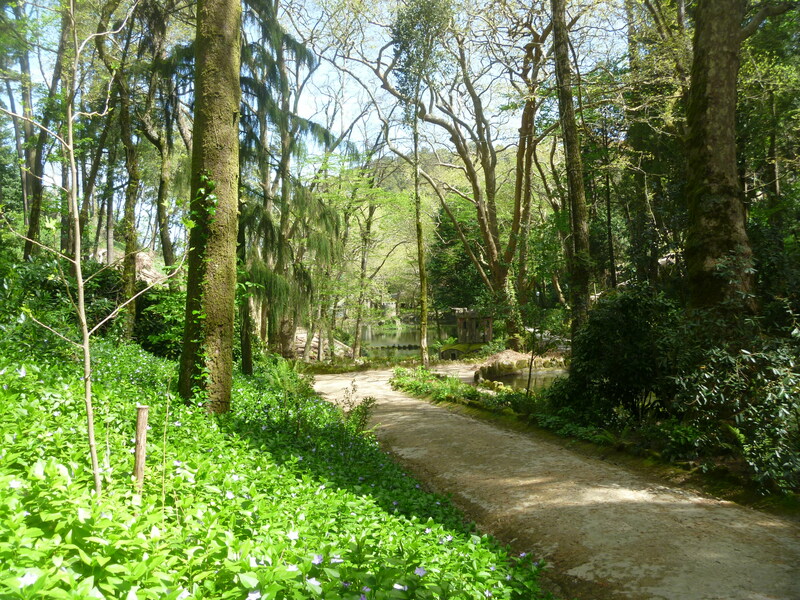 At the Entrance – there’s also a Nature Trail, but we didn’t have time to complete it. Leaving the Convento around 4pm we still had a lengthy walk ahead of us, plus two further climbs. 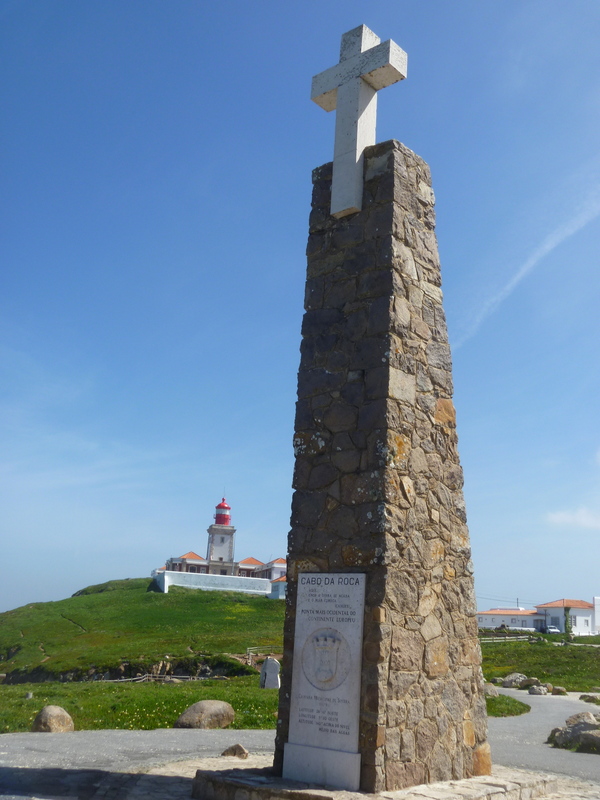 The first was to a memorial to 23 soldiers who were killed putting out forest fires in 1966. 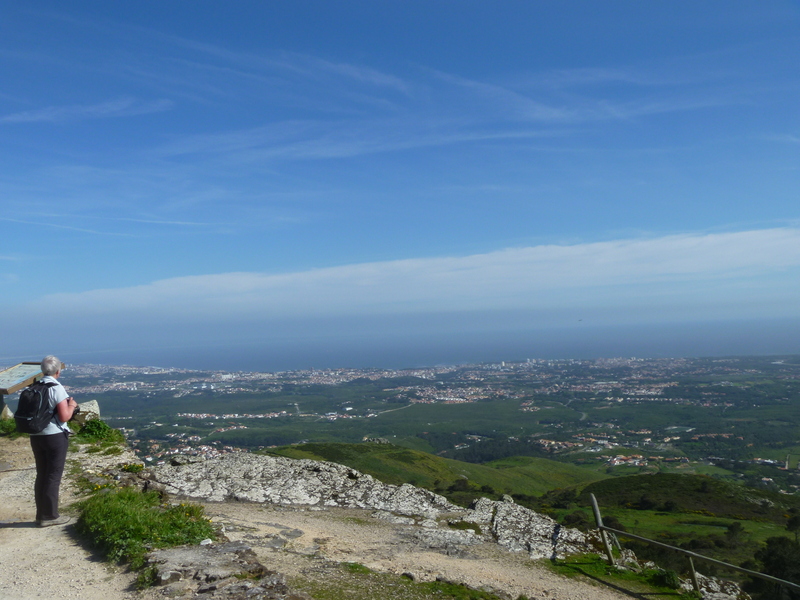 From the cross there are more stunning views – the Pena Palace magnificent in the distance. 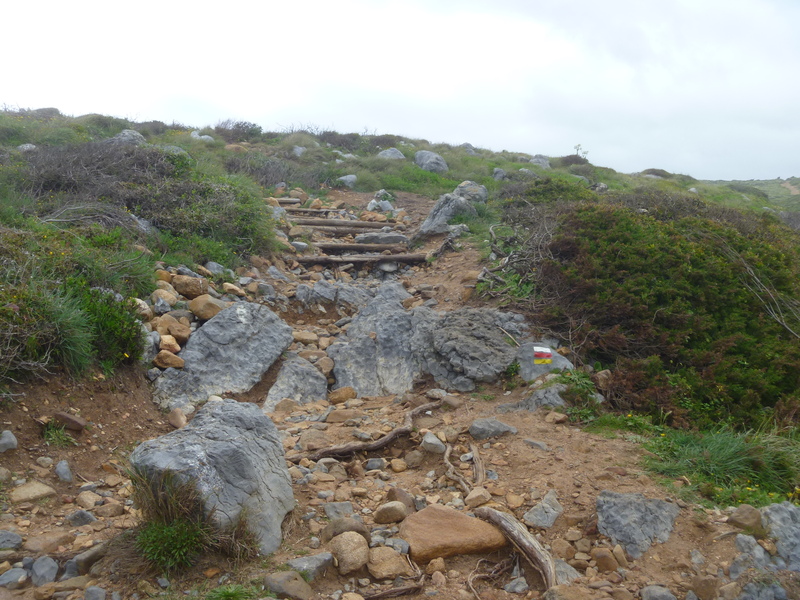 “Continue ahead uphill”. We got kind of used to reading this instruction! Onward and upward we continued until we reached the Peninha Chapel. Unfortunately the chapel wasn’t open to the public but we read that the first building on the site was a chapel to Sao Saturnino in the 12th century and that the ‘new’ chapel was built in the 17th century and apparently contains beautiful blue and white azulejos (tiles) depicting the life of Mary. 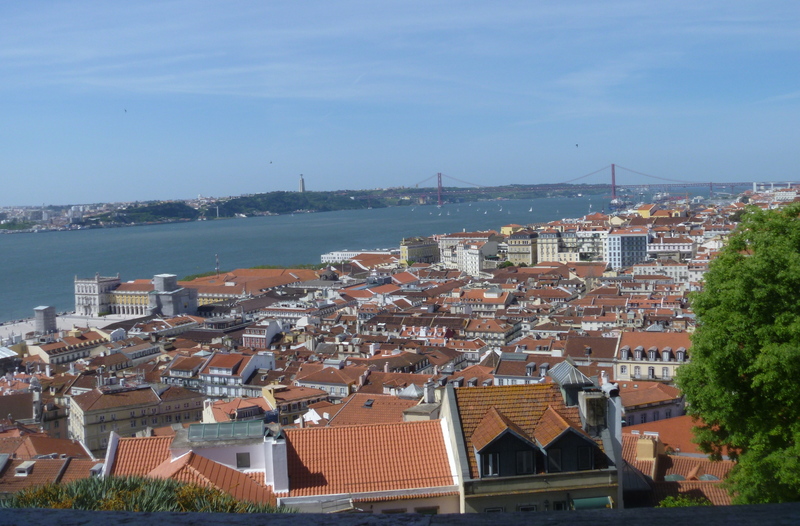 Again, we had magnificent views of the coast and towards the River Tagus and Lisbon. 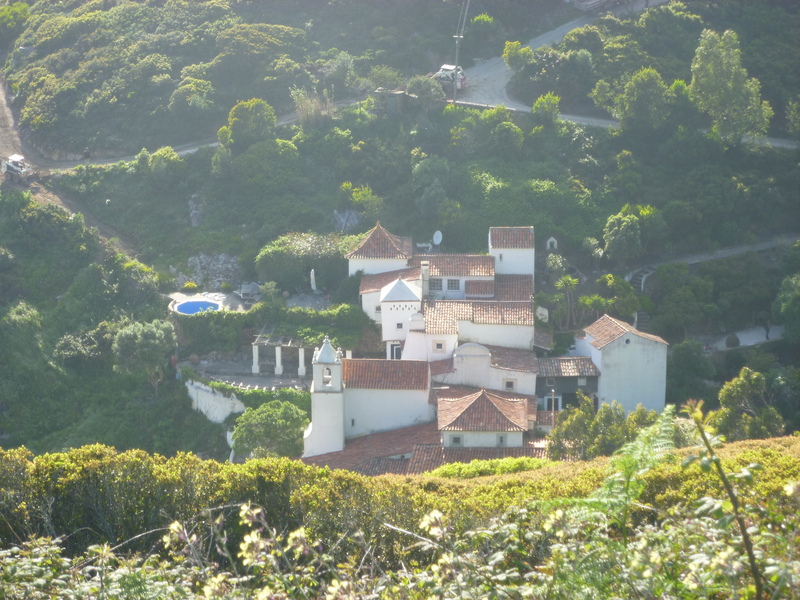 From the Peninha it was practically downhill all the way and finally, we caught a first glimpse of our destination – The Convento Sao Saturnino nestling a valley with views of the sea. 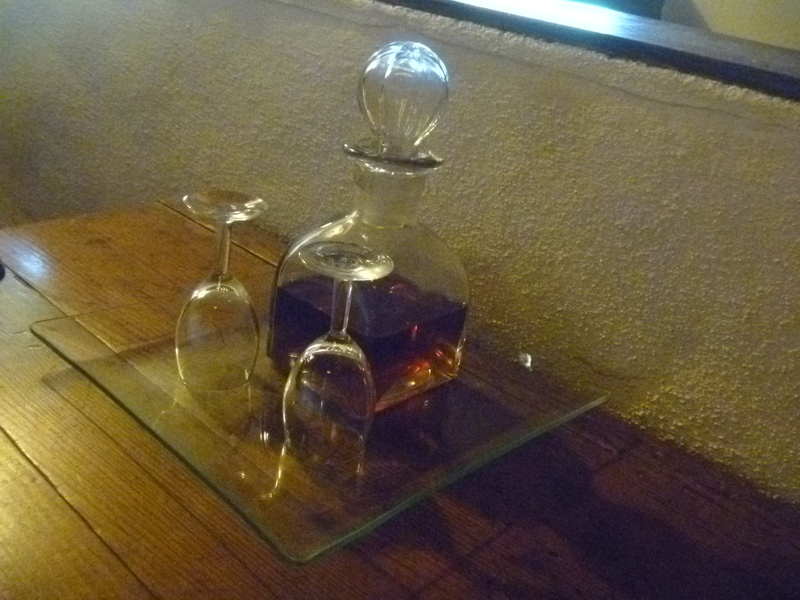 We arrived just in time for dinner – there’s a welcoming tray in the bedroom for revival of the spirits! 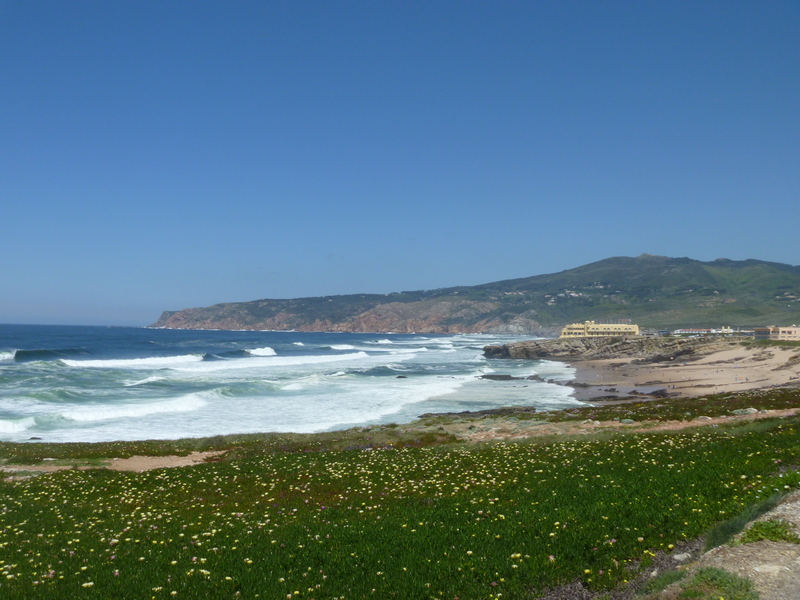 As you will have seen our first day’s walk was not too long and followed the Portuguese coastline from Cascais to Guincho. On the first day the walking distance is always a bit shorter than most others because it is your opportunity to meet with the Route Manager and discuss the route, any last minute changes and exchange mobile ‘phone numbers. We spent a sunny Sunday morning in a park with Ana, our manager, as there was a big 10k race going on right outside our hotel meaning that access was made rather difficult. Ana had to explain to us that very severe storms last January had caused much damage along the route and some of the paths were now impassable. She had done her homework though, and walked the whole length trying to re-jig the route in just a couple of places. Luckily she was also on the end of the ‘phone when we needed a bit of clarification on a couple of days. Our route that morning was busy and ran parallel with the coast road. Lots of walkers, families, joggers and cyclists shared the route with us. 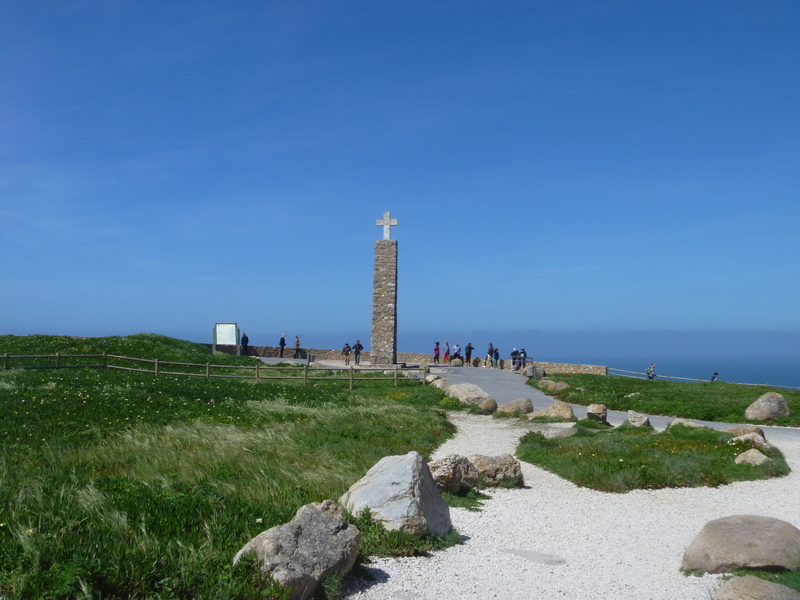 We passed lighthouses and dramatic coastal features and were able to take a brief break at The Forte de Sao Jorge de Oitavos. 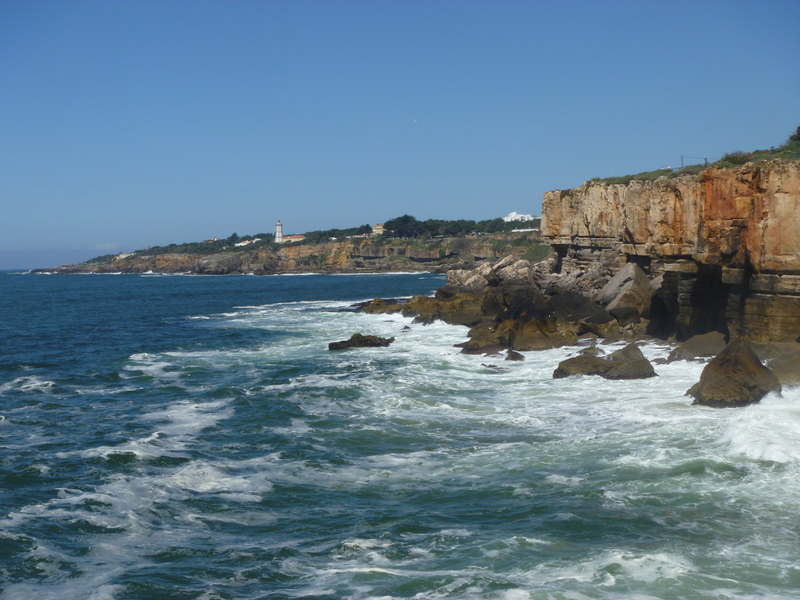 Not far from Cascais is the Boca do Inferno or Hell’s Mouth. 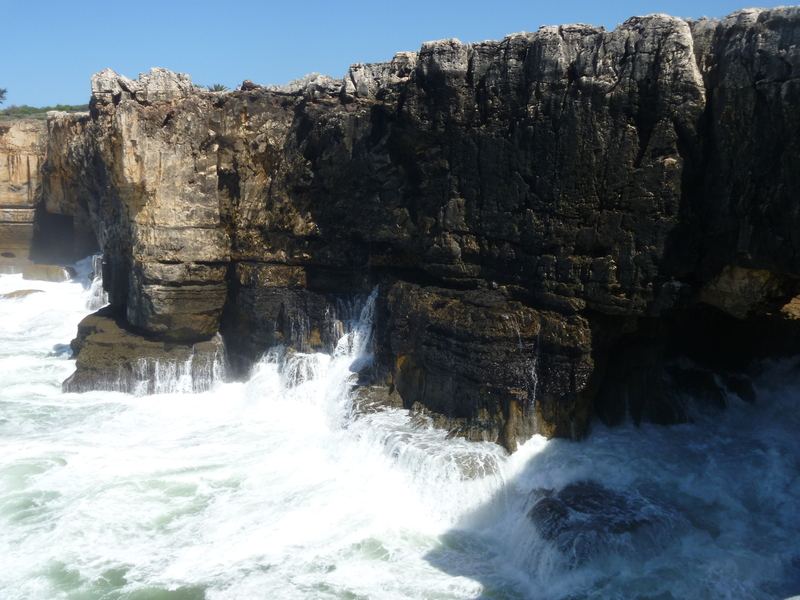 “This is a natural chasm and the sea water has access to the very bottom of the chasm so when the sea is unsettled the effect is quite impressive!” [From our Route Booklet] Even when the sea is pretty calm the effect is still pretty impressive! There is a viewing area just down from the path. 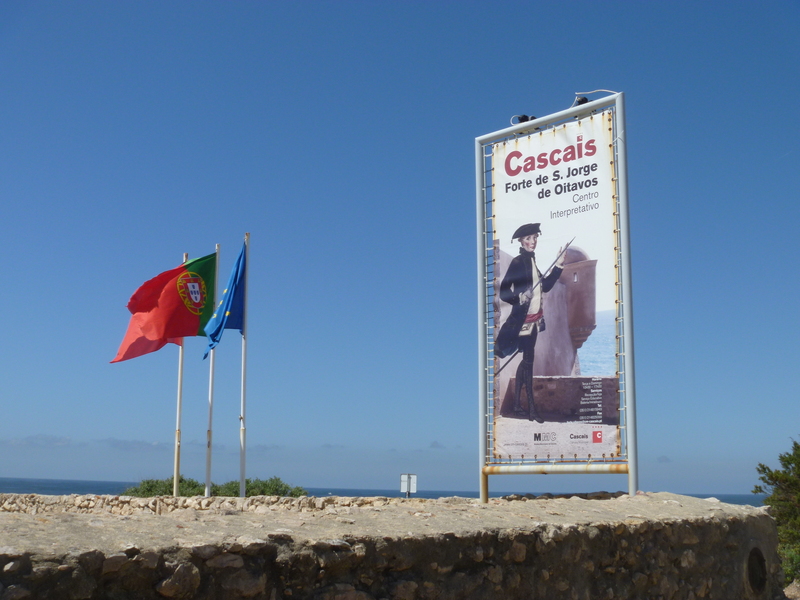 Probably about midway between Cascais and Guincho is the The Forte de Sao Jorge de Oitavos. It’s a handy visitor’s centre along the coast and has exhibitions and displays as well as a sheltered courtyard out of the wind. 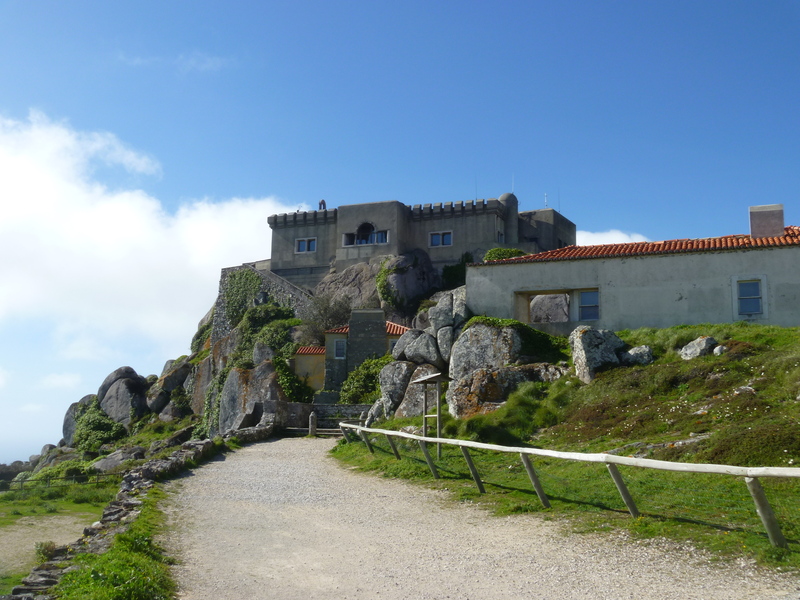 It was built as a defensive fortification against possible landings by pirates or invaders between 1642 and 1648. The shortish walk meant that we arrived at our most luxurious hotel The Fortaleza do Guincho in the early afternoon giving us plenty of time to relax and read enjoy a late lunch and later an afternoon tea on the sunny terrace overlooking the dramatic waves and nearby beaches followed by a bar meal dinner in the sumptuous lounge area. We needed this rest and recuperation after the long day of travelling the day before and the next day’s walk – the longest of the trip.